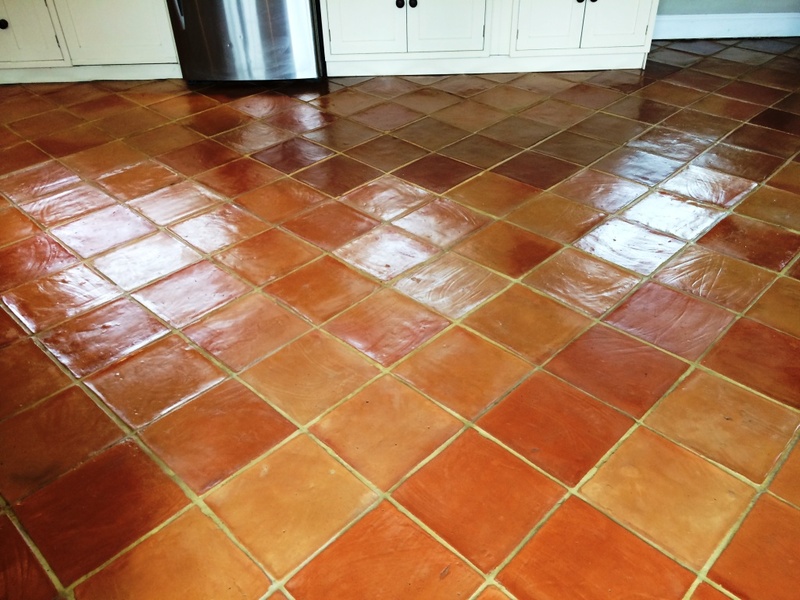 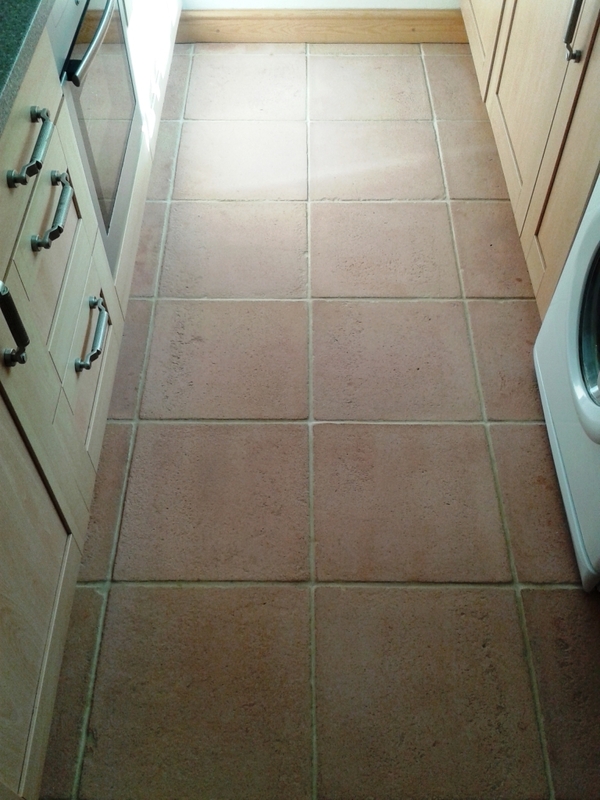 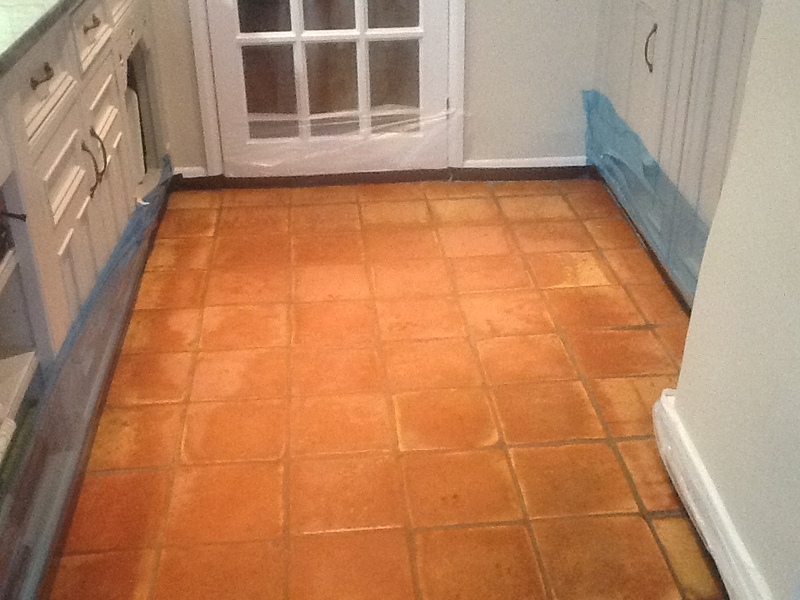 I returned 48 hours later and sealed the Terracotta tiles using four coats of Tile Doctor Pro-Seal which is a water based (no smell) penetrating sealer recommended for food preparation areas such as kitchens. 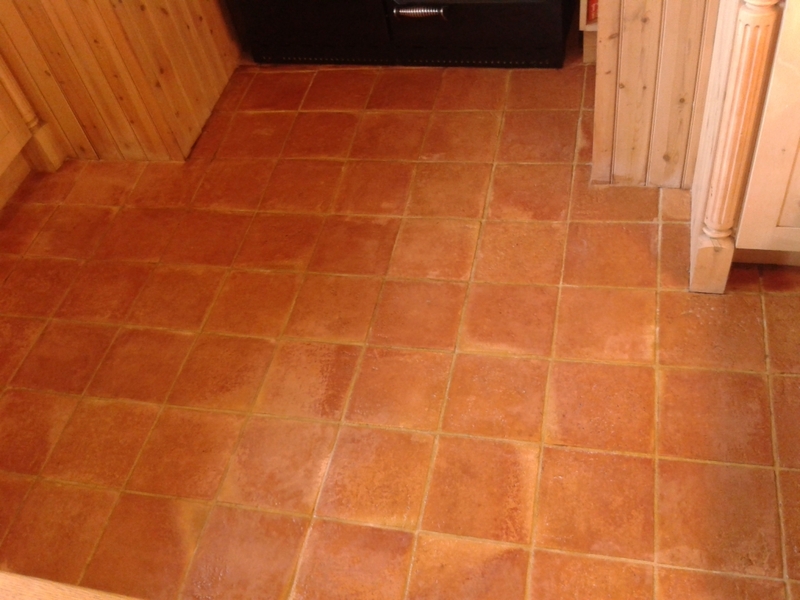 Sealers can take some time to apply as you have to wait for the first coat to dry before applying the next, fortunately however we were blessed by a warm windy day which blew through the kitchen and increased the drying time. 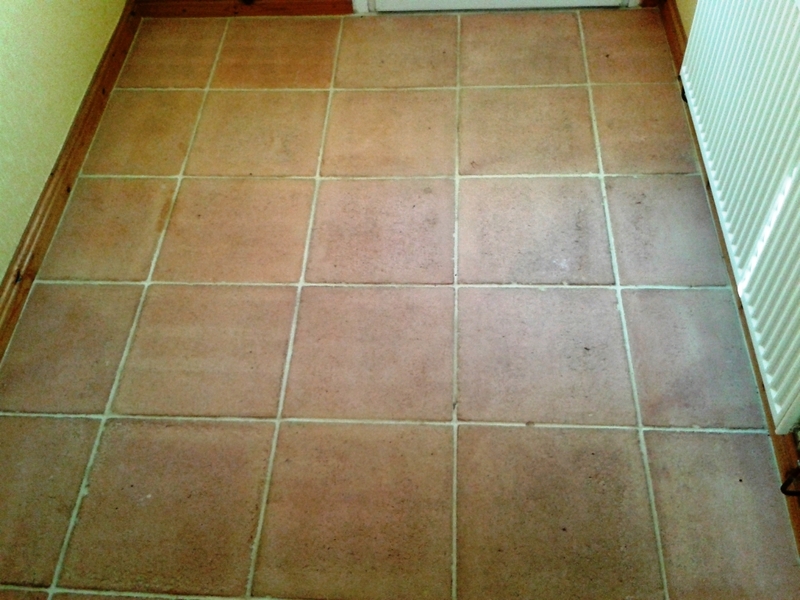 You can see from the pictures on this page the amazing transformation that was achieved. 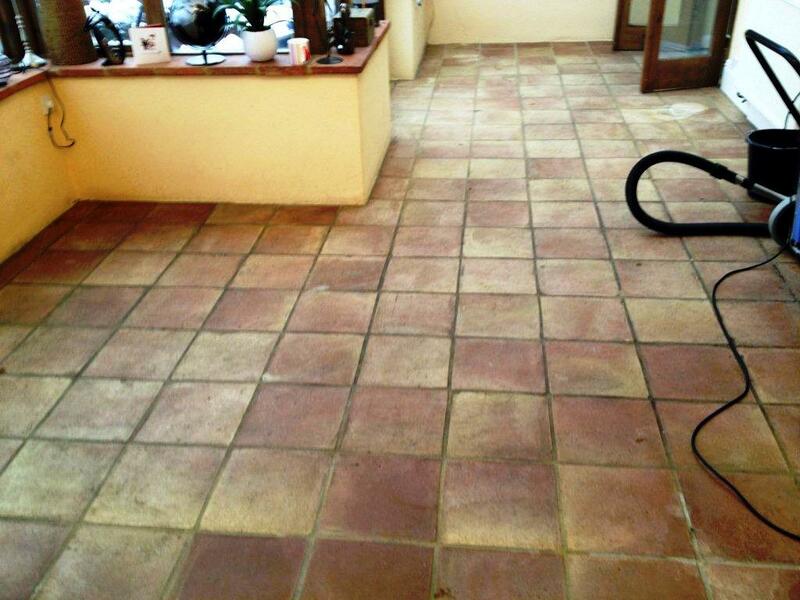 Whilst I was waiting for the sealer to dry I noticed their patio was in need of attention so I gave that a blast from my industrial pressure washer. 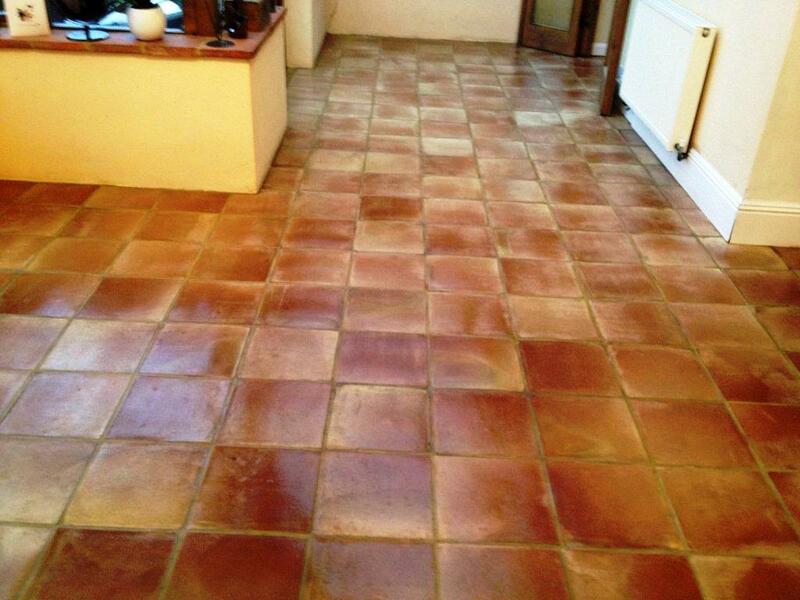 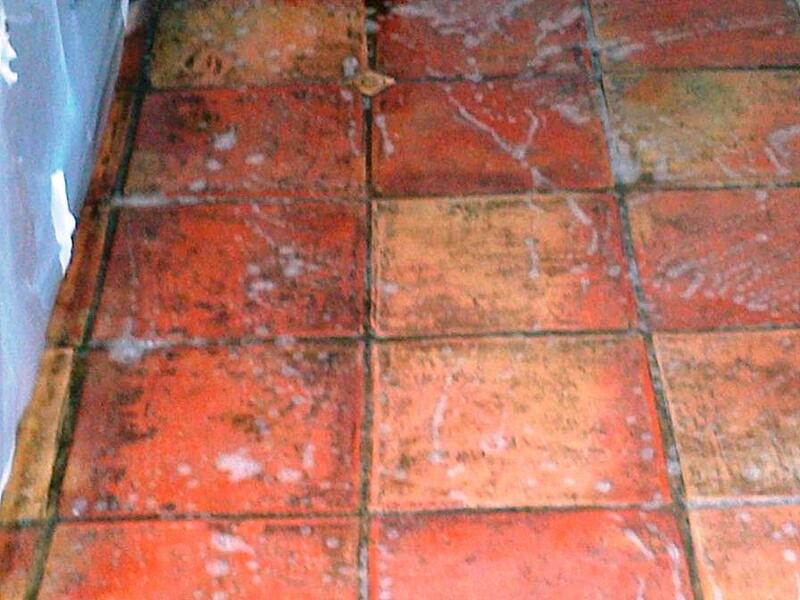 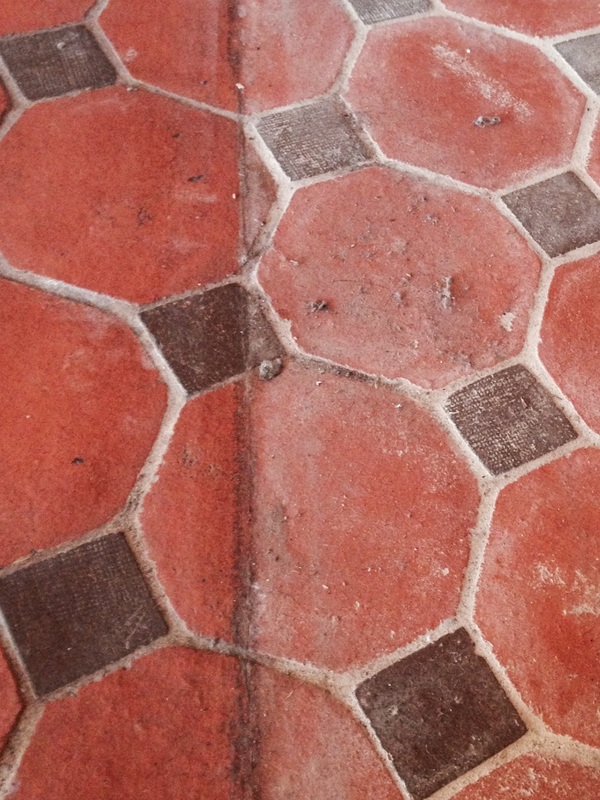 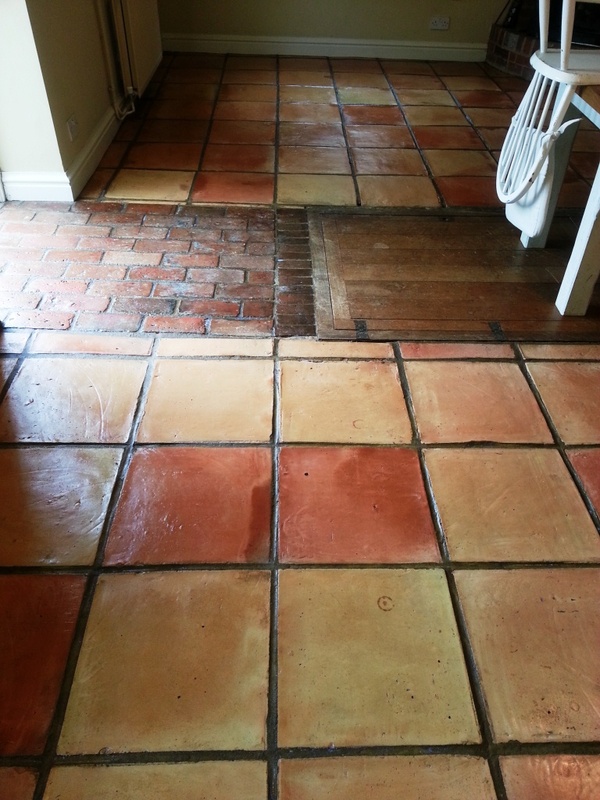 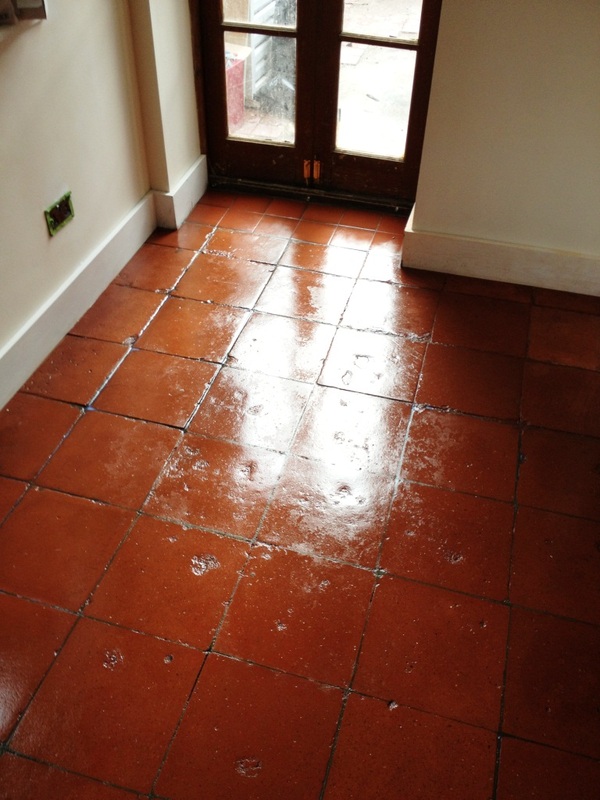 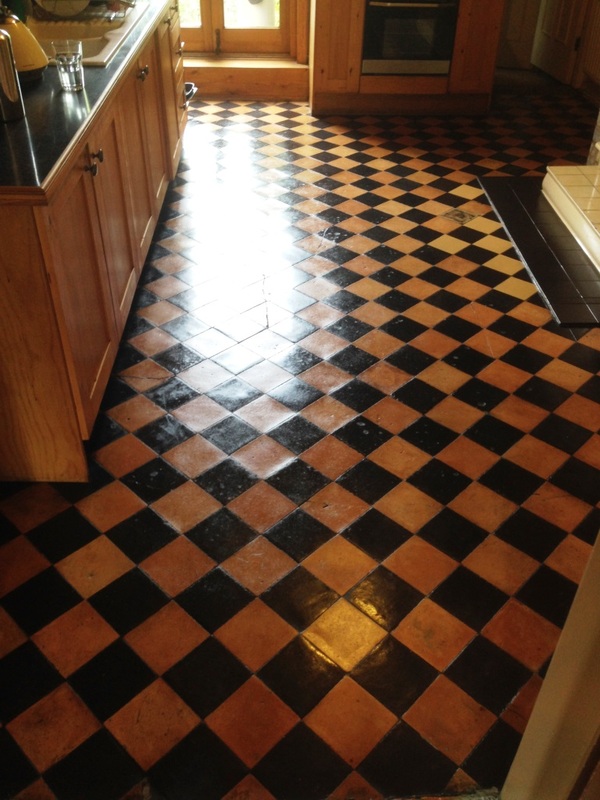 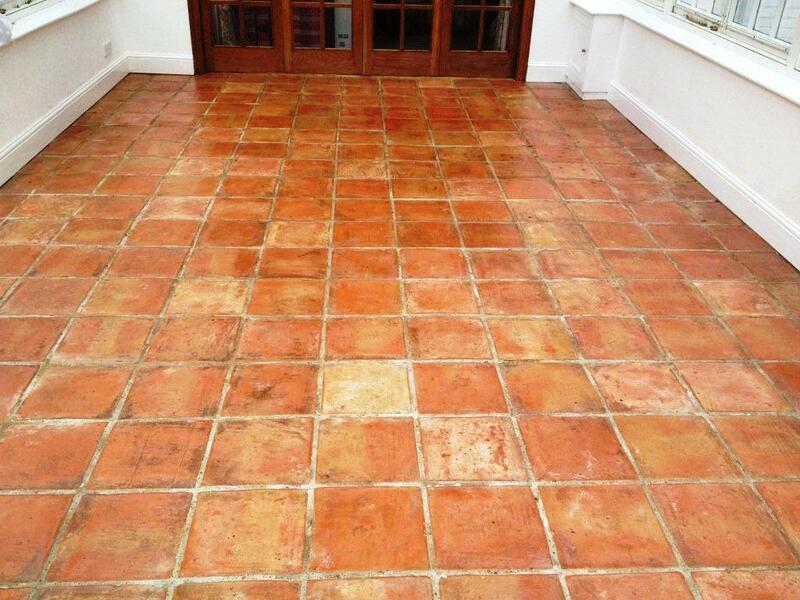 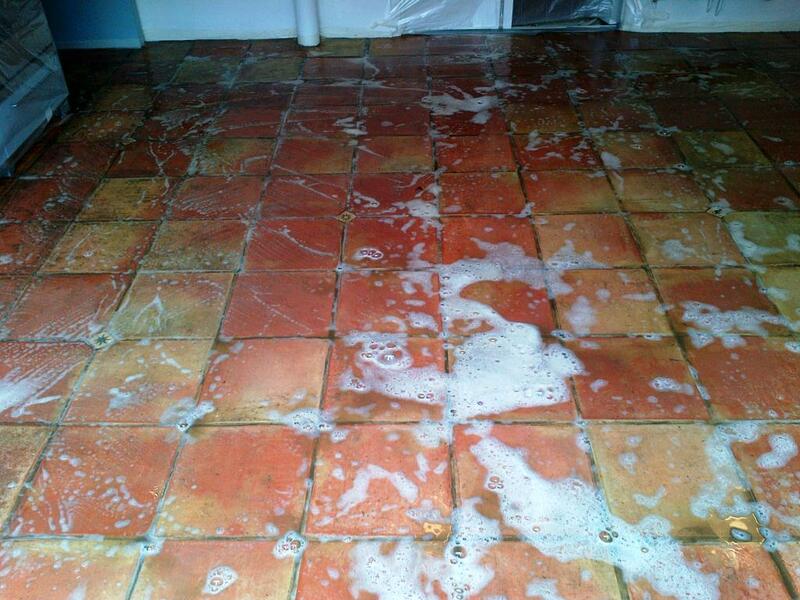 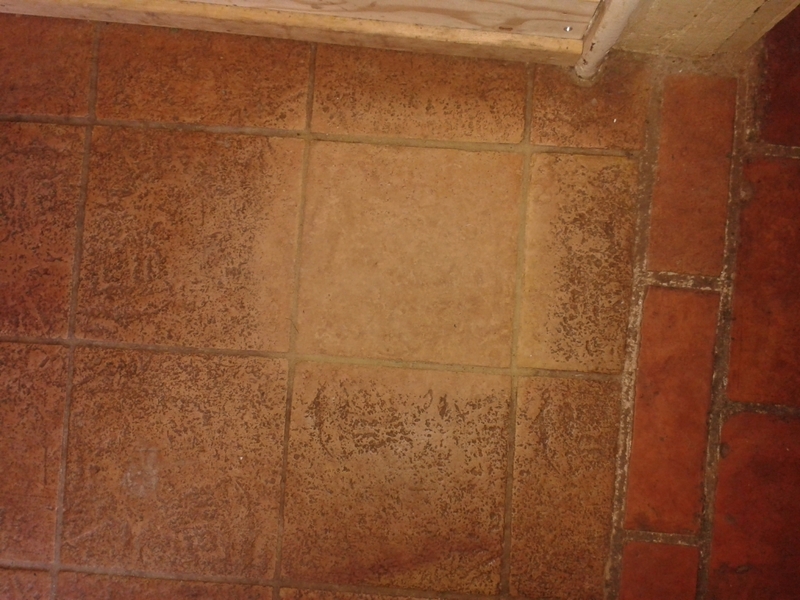 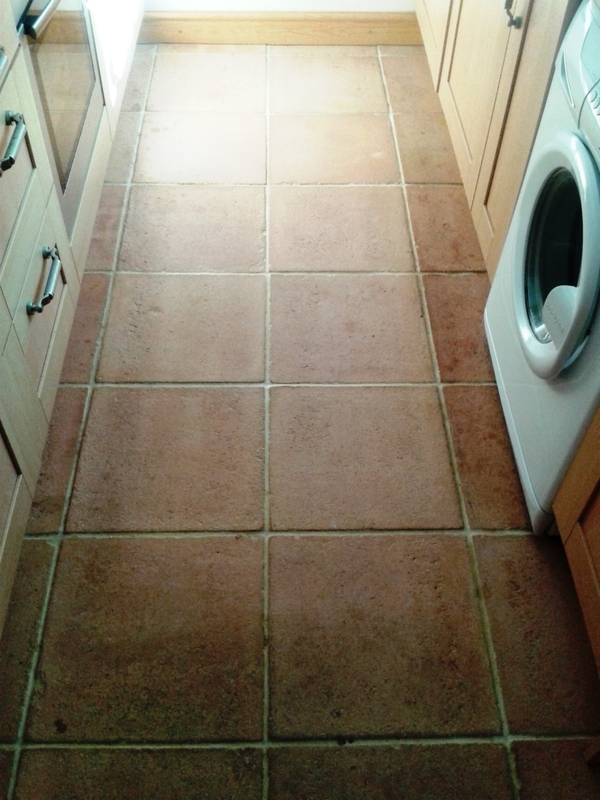 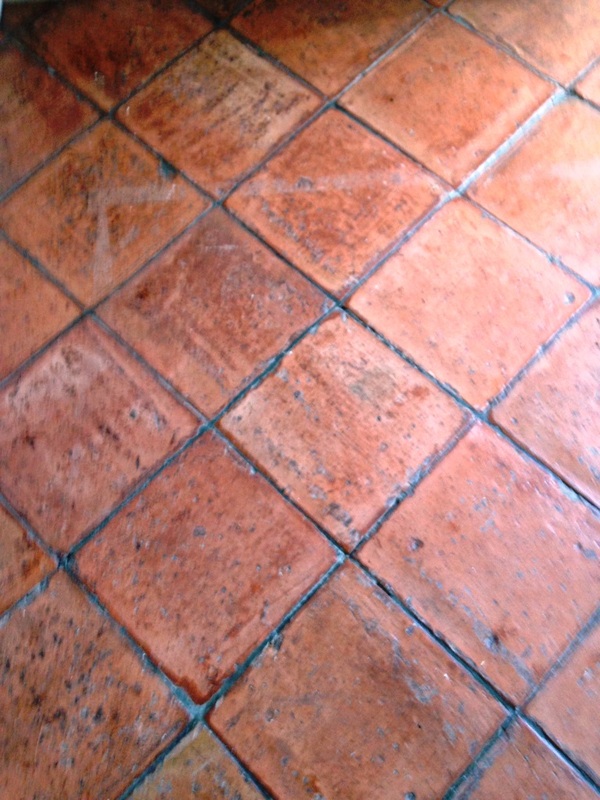 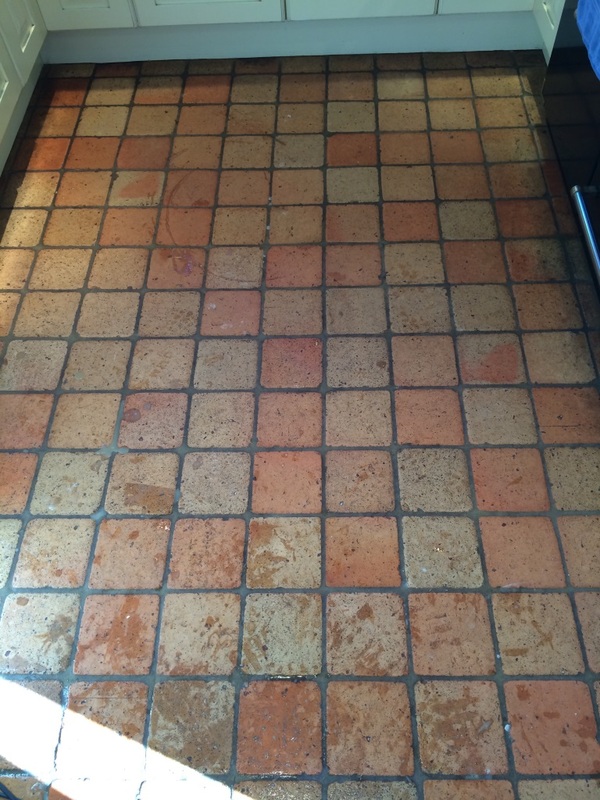 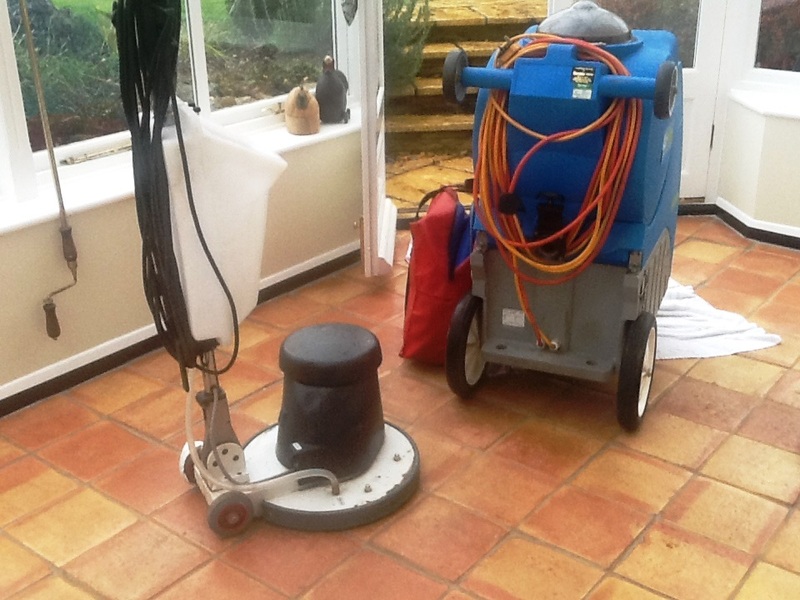 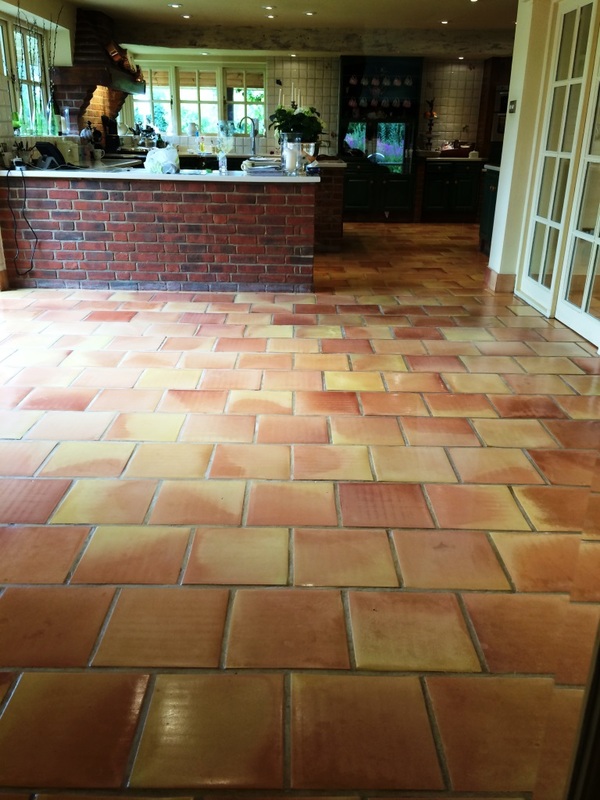 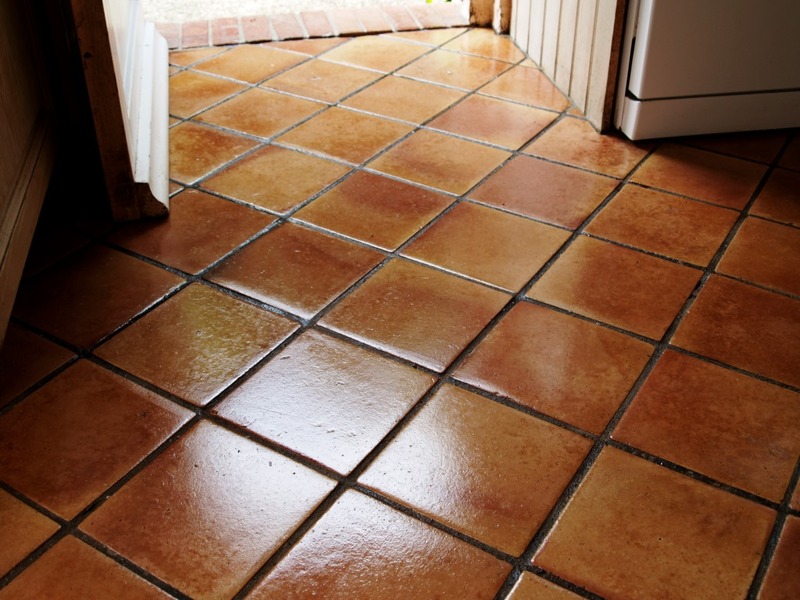 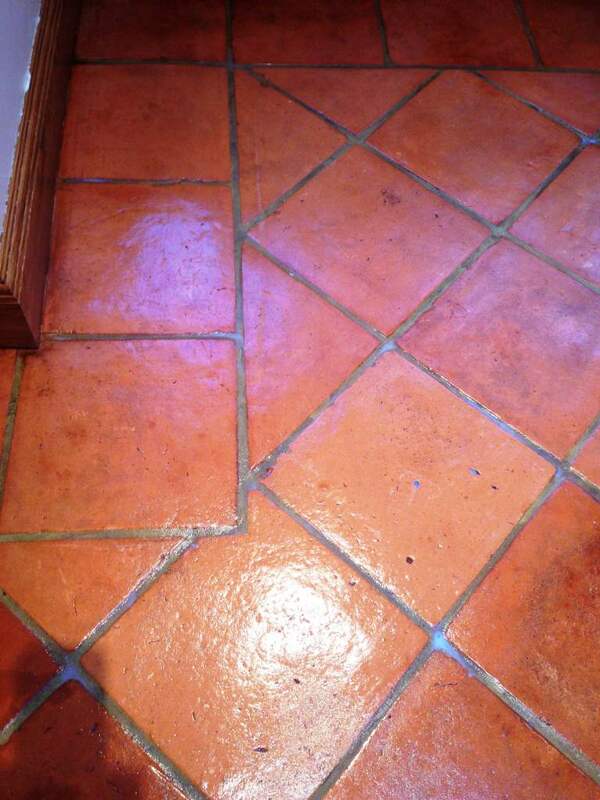 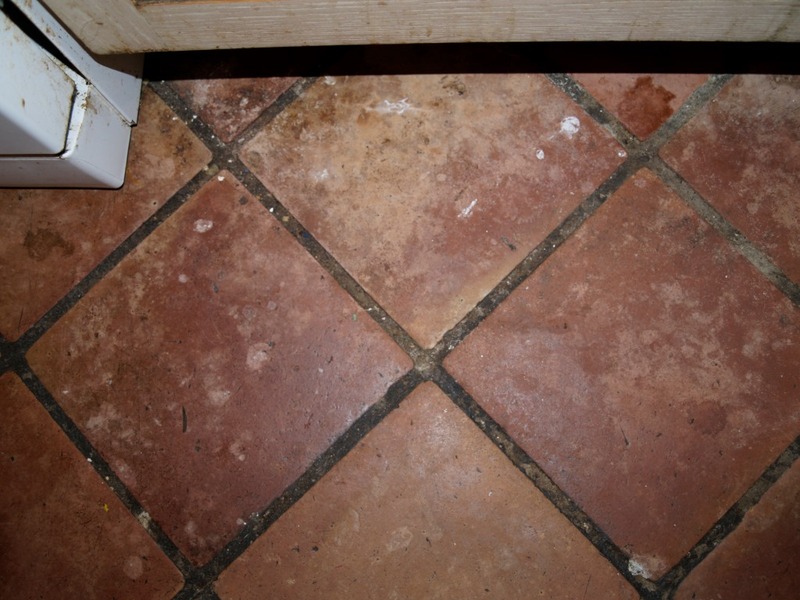 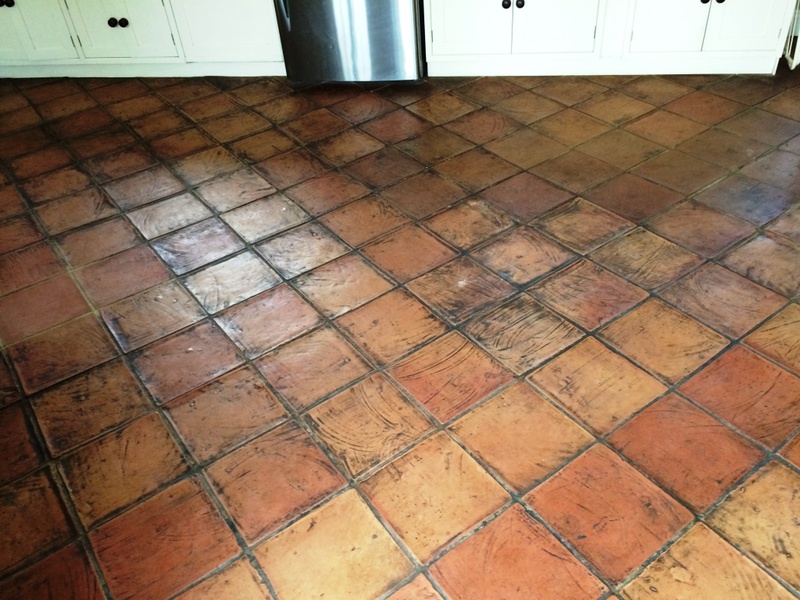 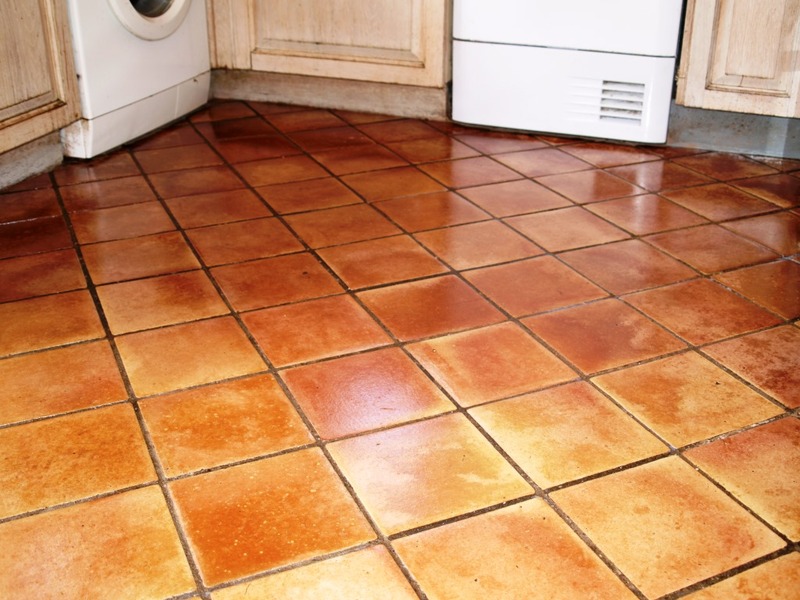 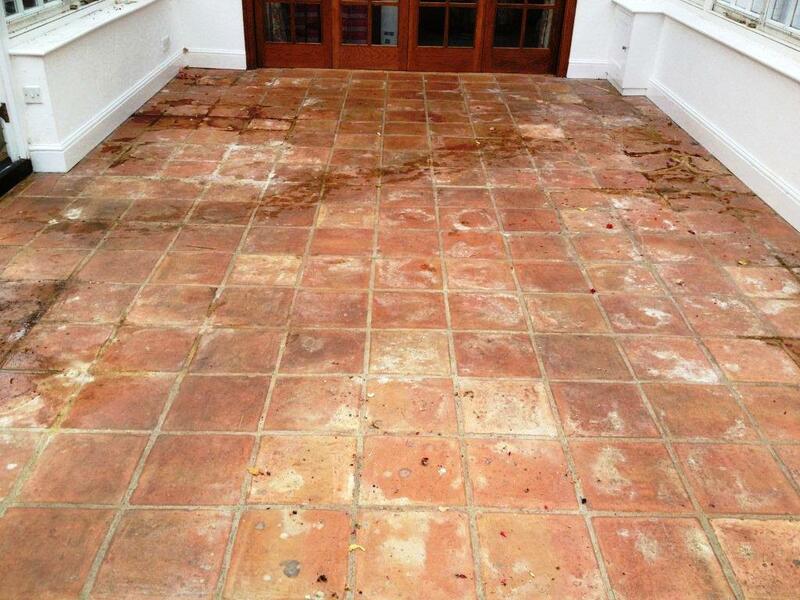 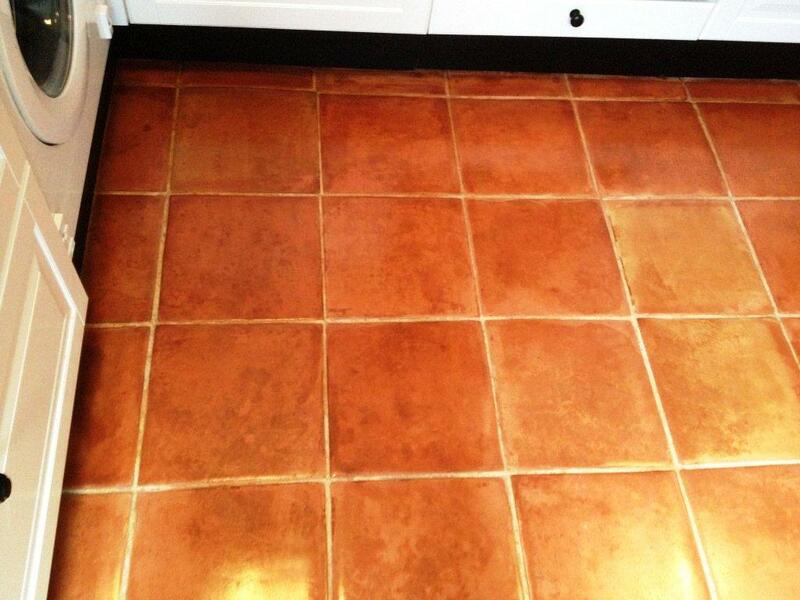 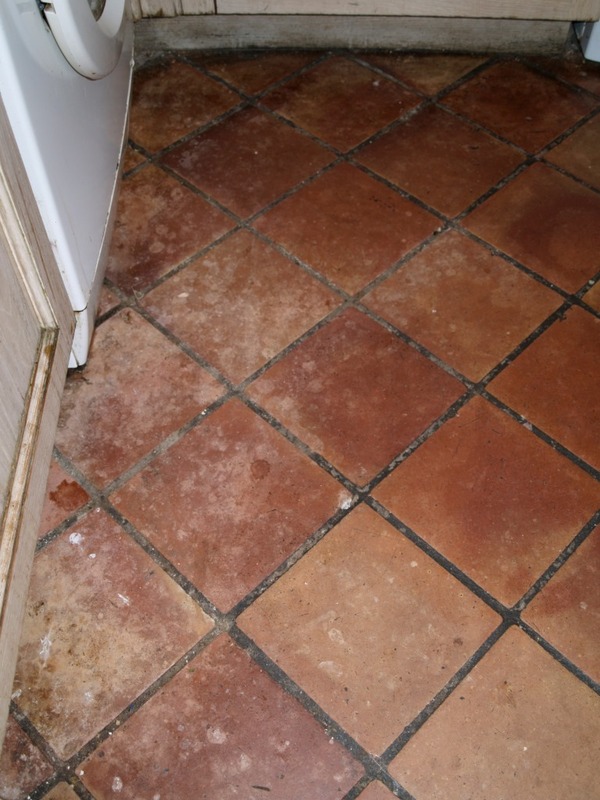 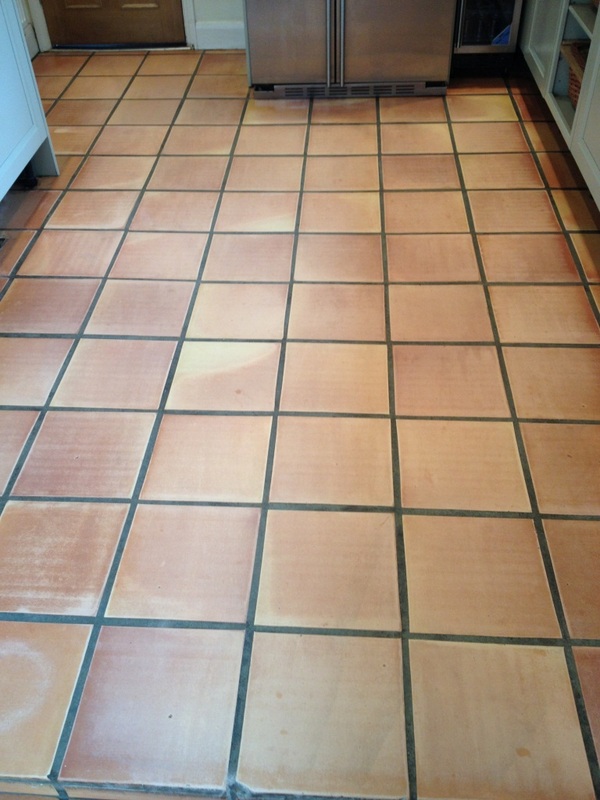 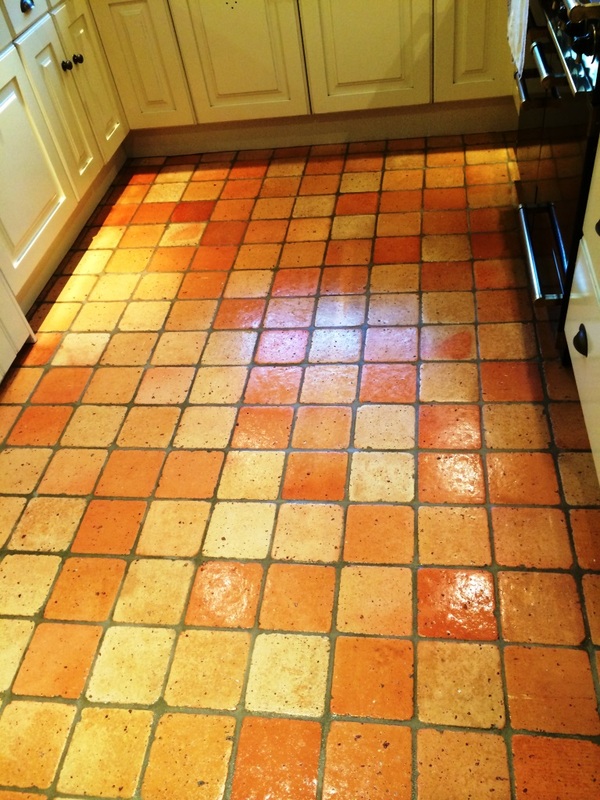 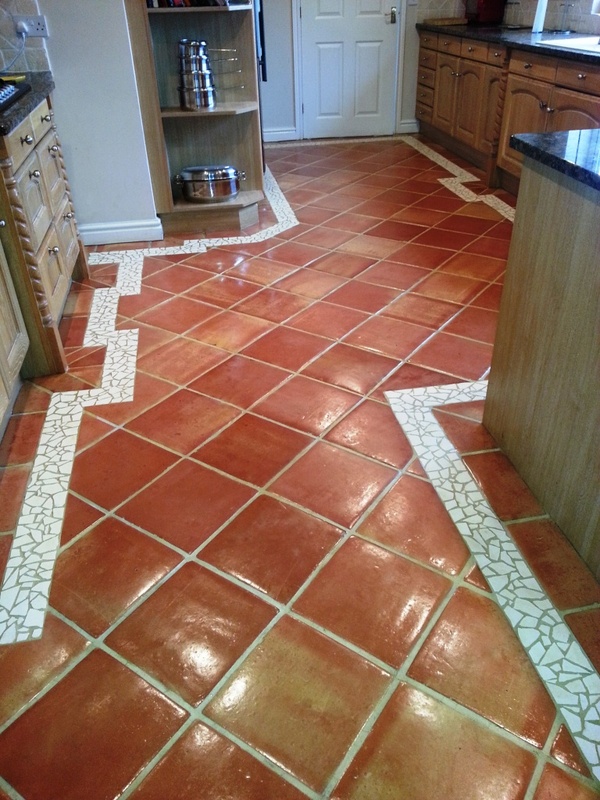 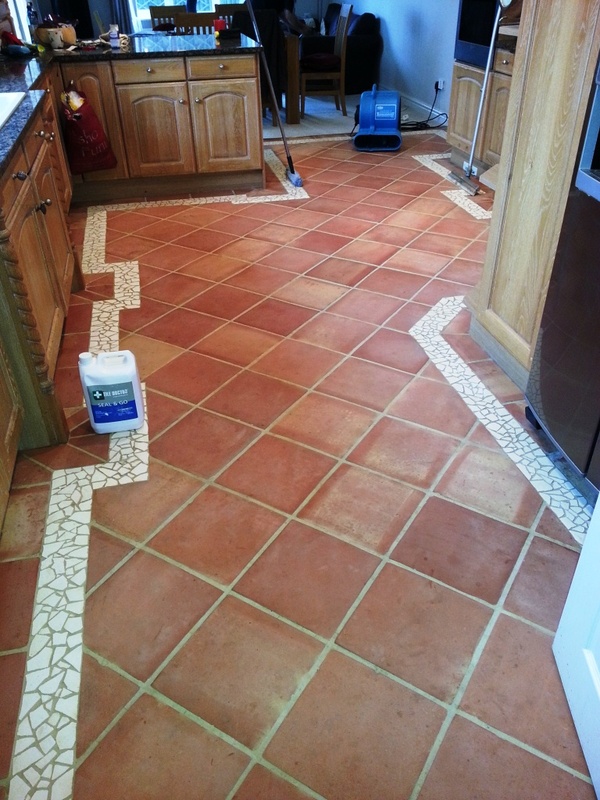 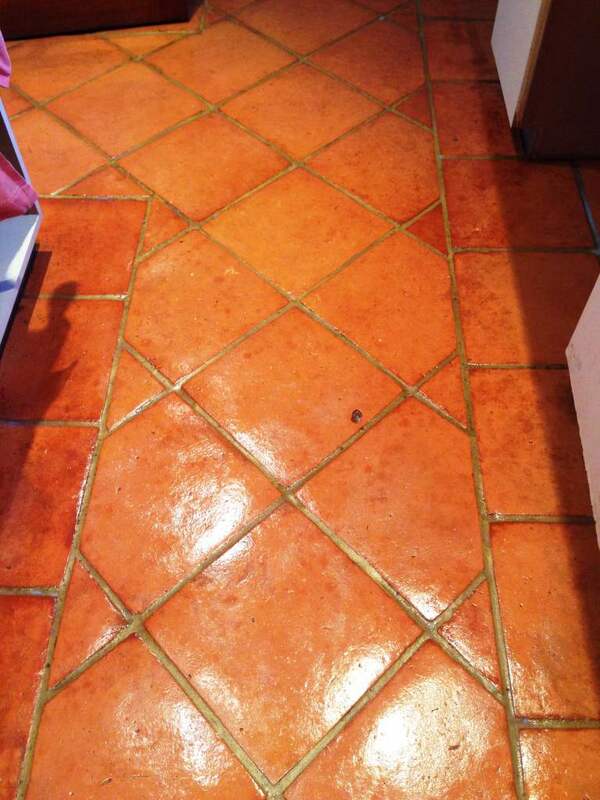 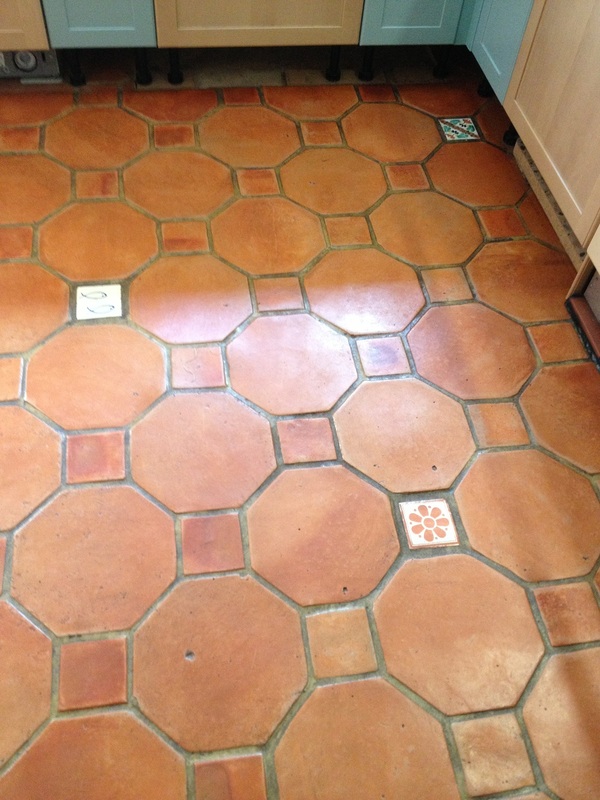 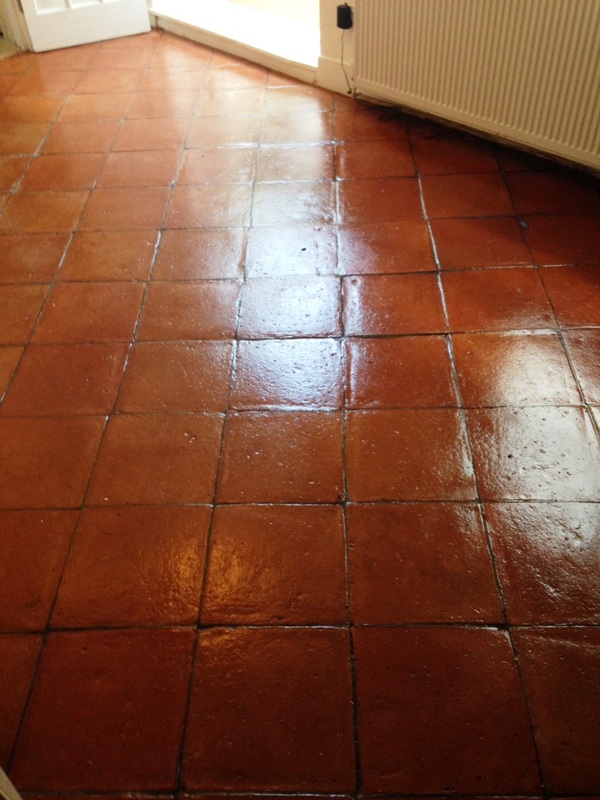 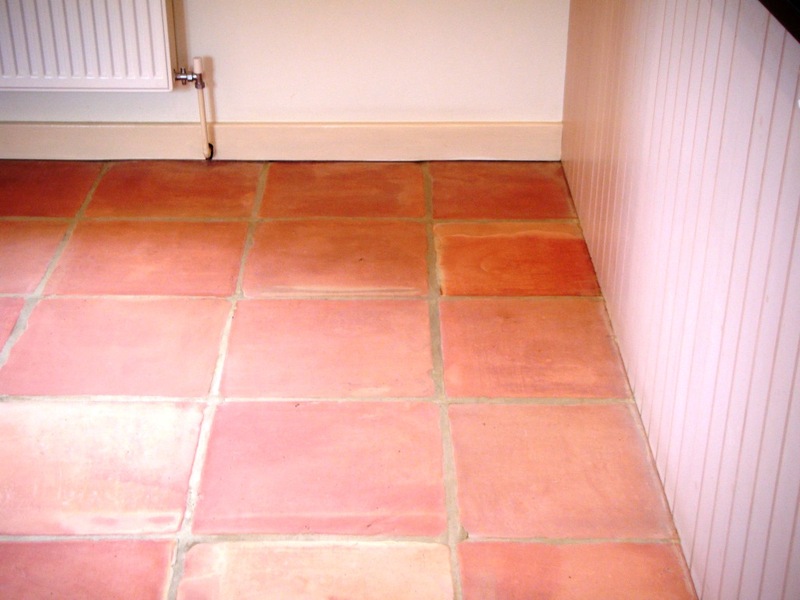 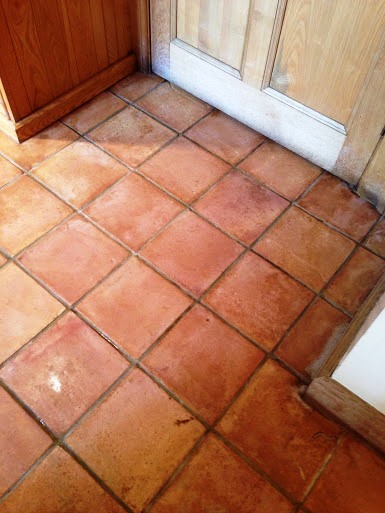 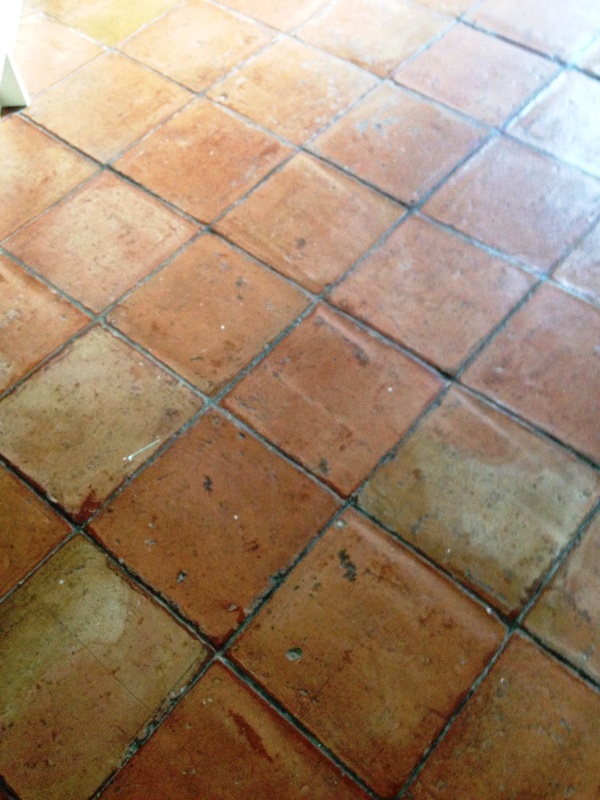 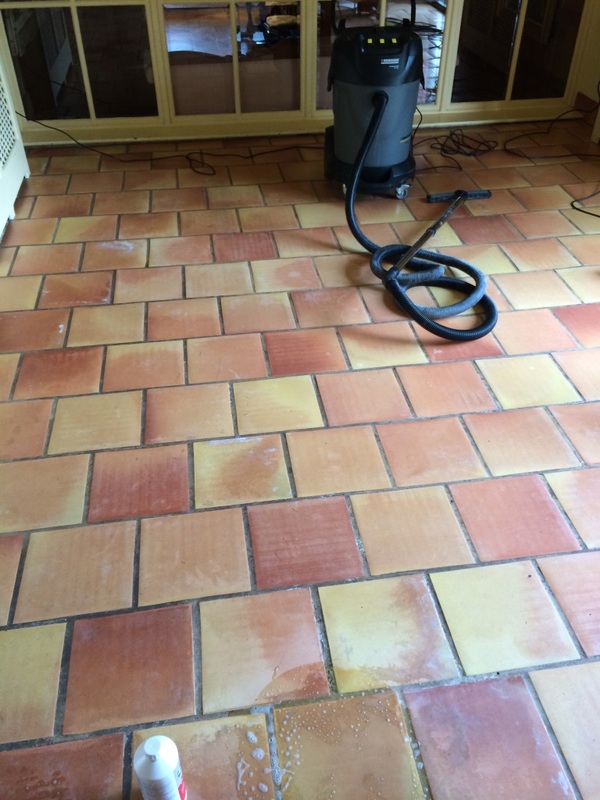 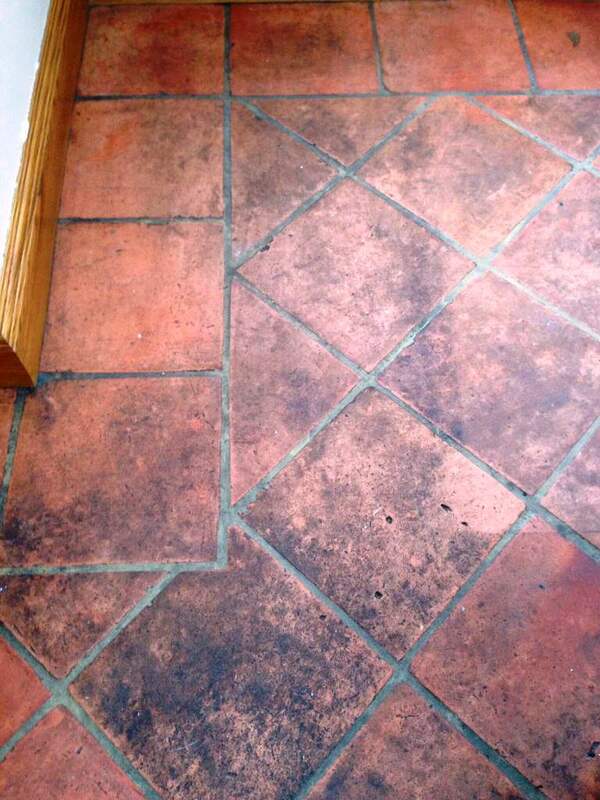 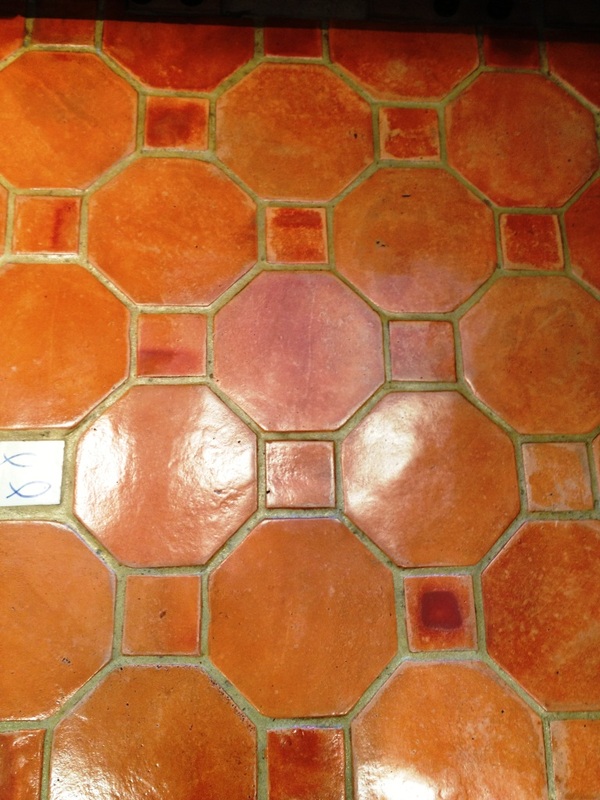 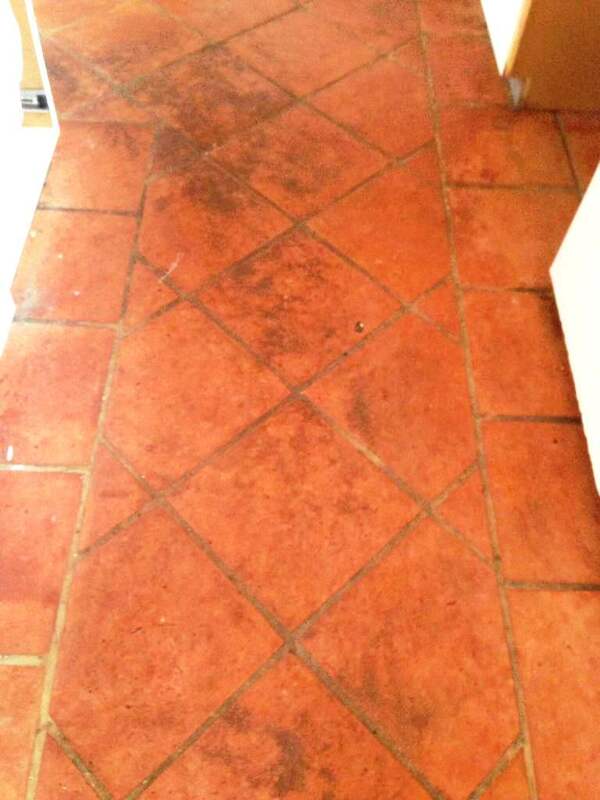 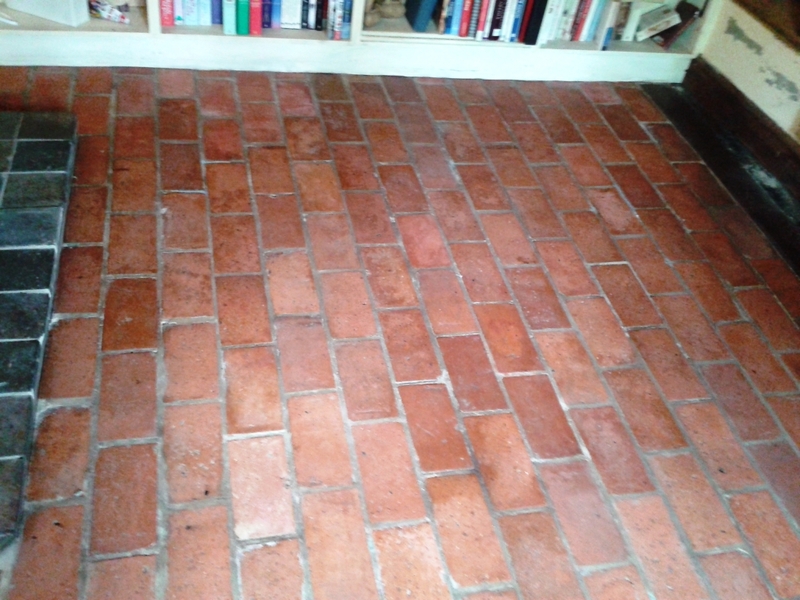 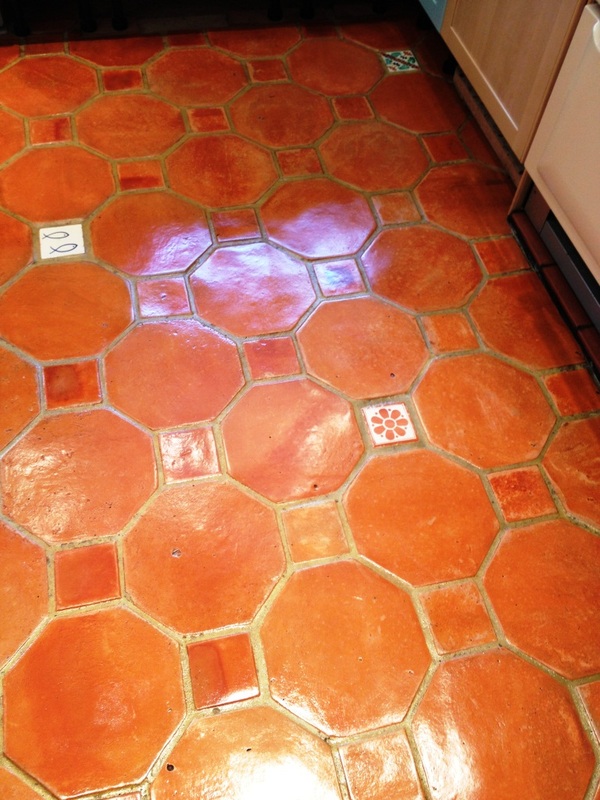 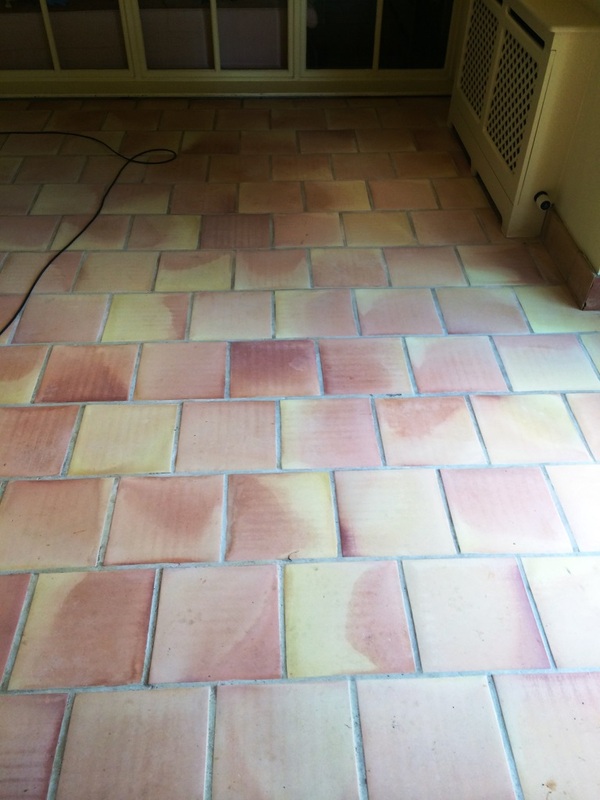 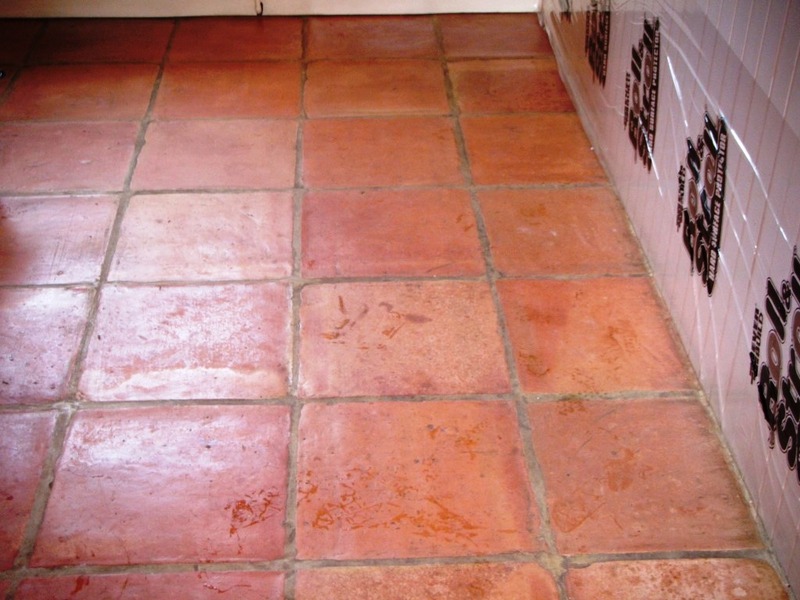 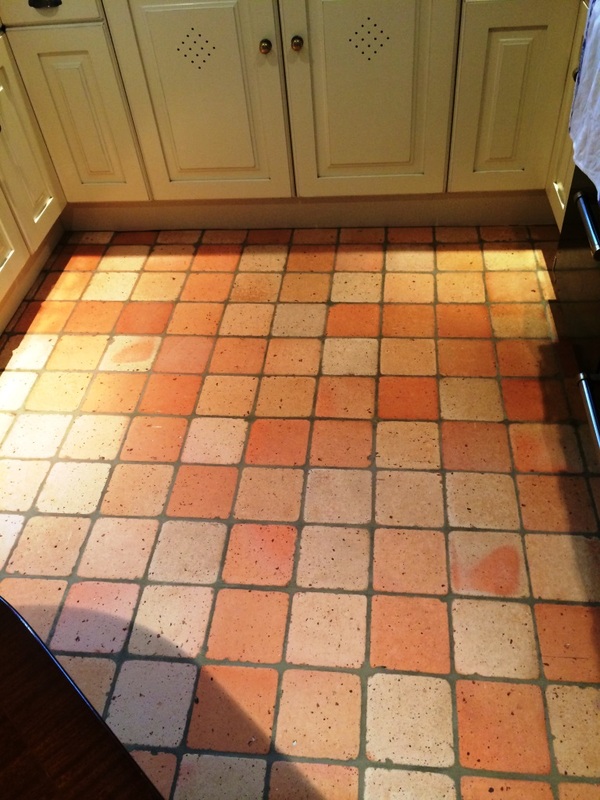 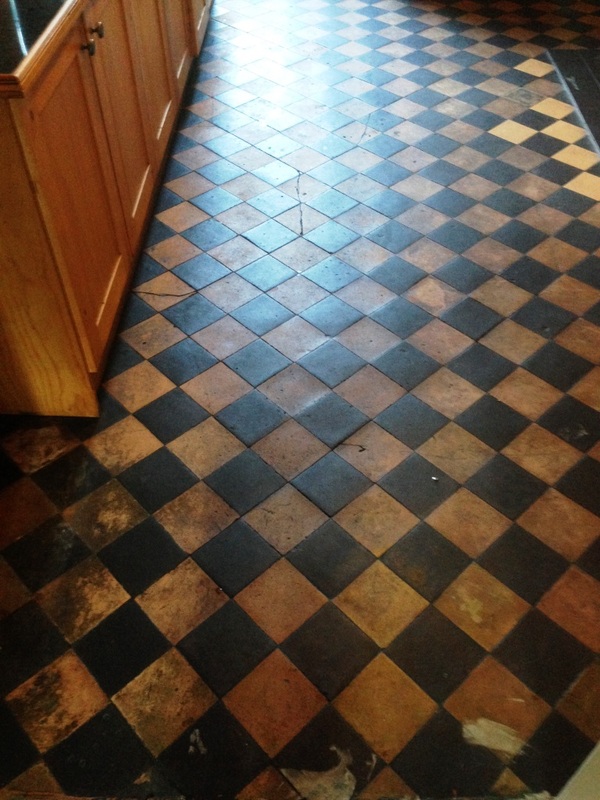 These photographs of a Terracotta tiled floor came from a house in Melbourne Market Harborough, as you can see the tile was looking tired and the grout had gone dark with staining. 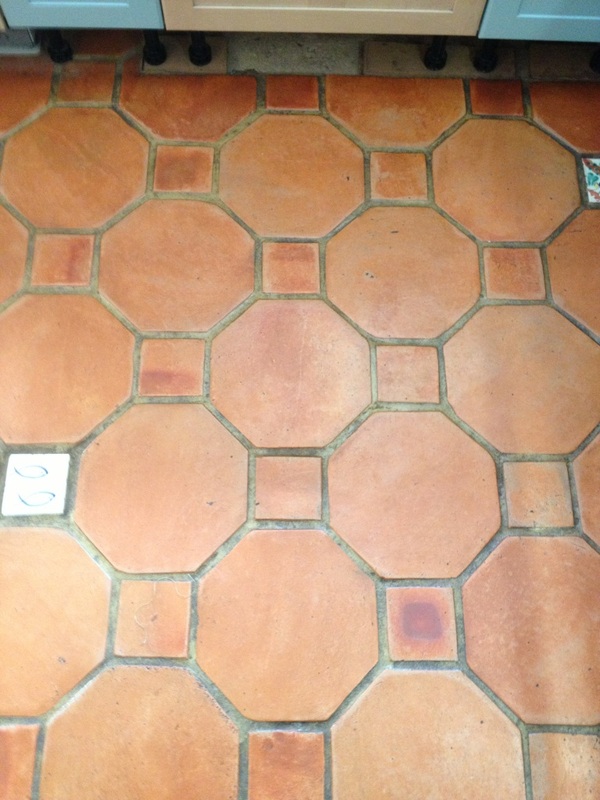 Before starting work the tile perimeter was protected using plastic sheet. 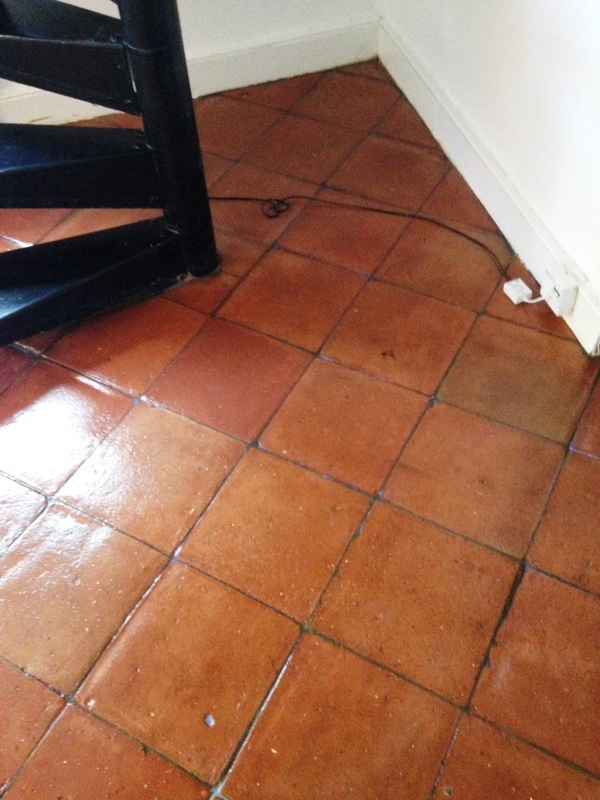 Next I could see the floor had been sealed previously but was now looking patching where the sealer had worn off in the high traffic areas and so to get a consistent look to the tile it would be necessary to remove it and strip the floor back to its original condition. 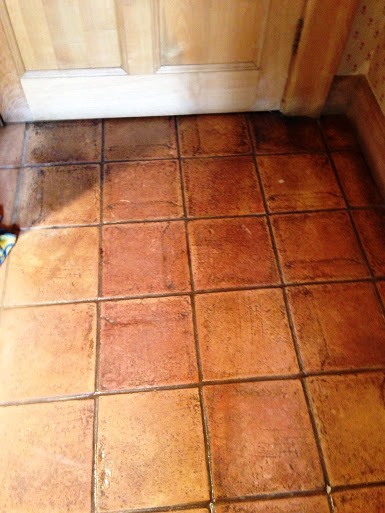 To remove the old sealer I used a dilution of Tile Doctor Remove and Go which was left to soak into the tiles for about 10 minutes before being worked in with a rotary machine fitted with a black scrubbing pad. 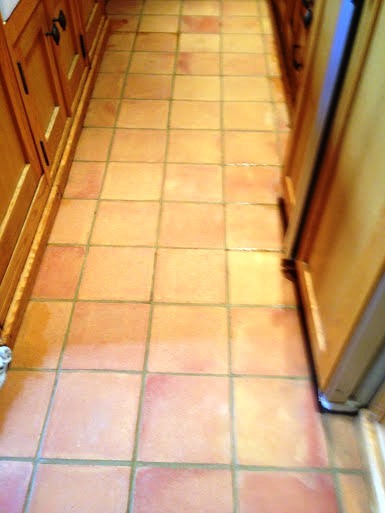 The grout also needed attention so this was scrubbed by hand using a grout brush. 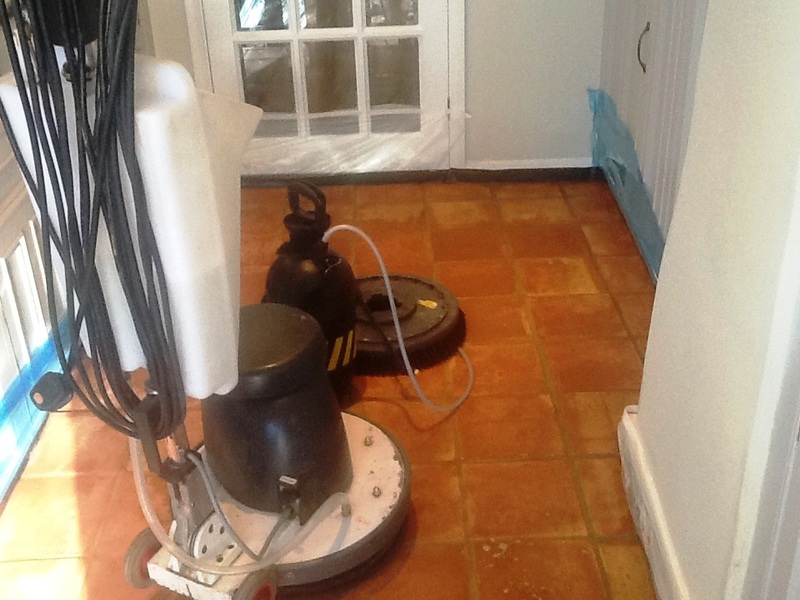 The soiled cleaning solution was then removed using a wet vacuum and the floor rinsed; it was apparent at this stage more work was need so the stubborn areas were re-treated using the same process and when I was finally happy with the results the floor was rinsed thoroughly and the wet vacuum was used to get the floor as dry as possible. 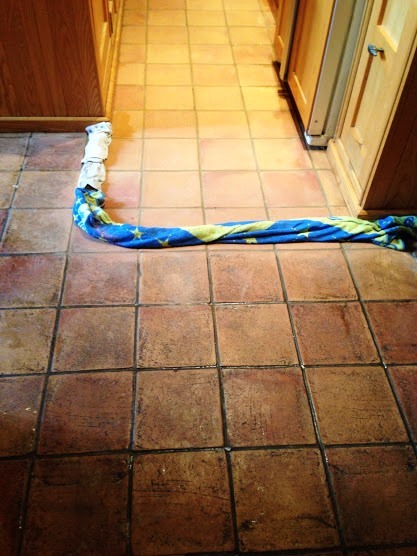 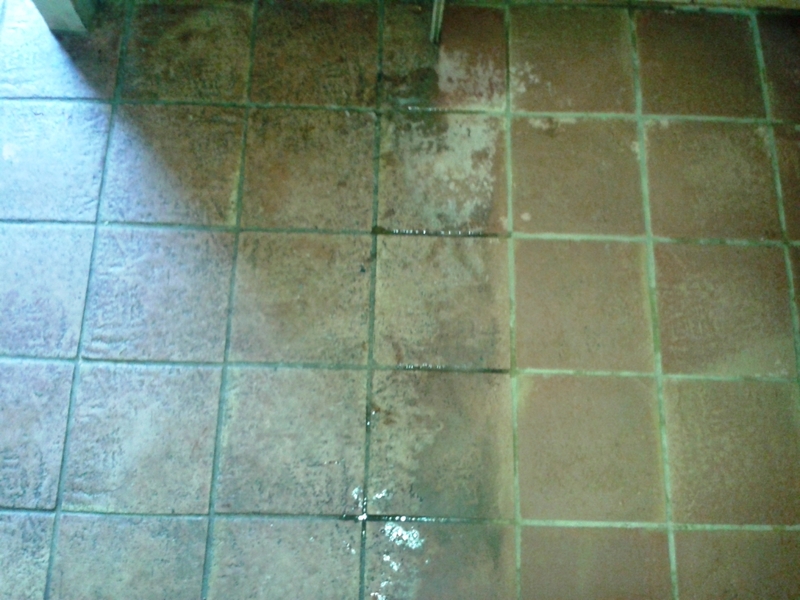 The floor was left to dry overnight and we returned the next day to re-seal the tiles. 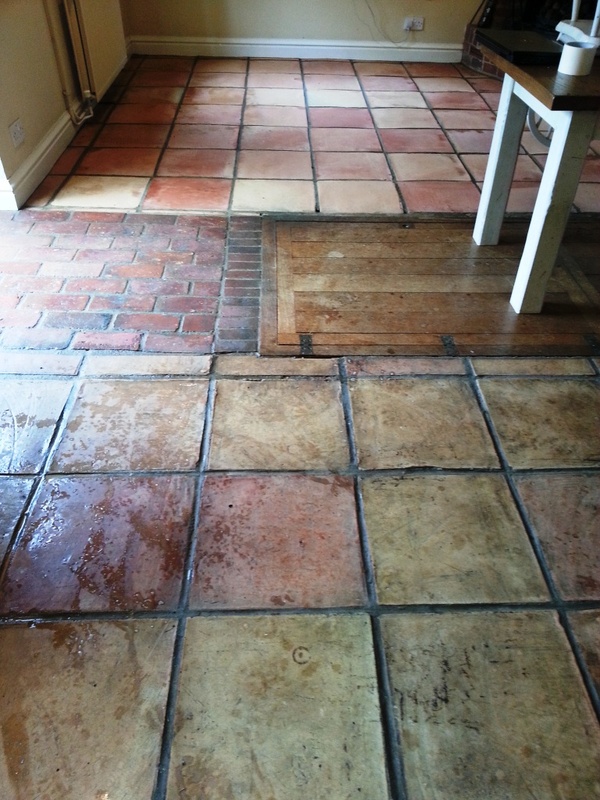 After discussing the options with the house owner we went with Tile Doctor Colour Grow which is a penetrating sealer that fills the pores of the tiles enhances the colour in the process. 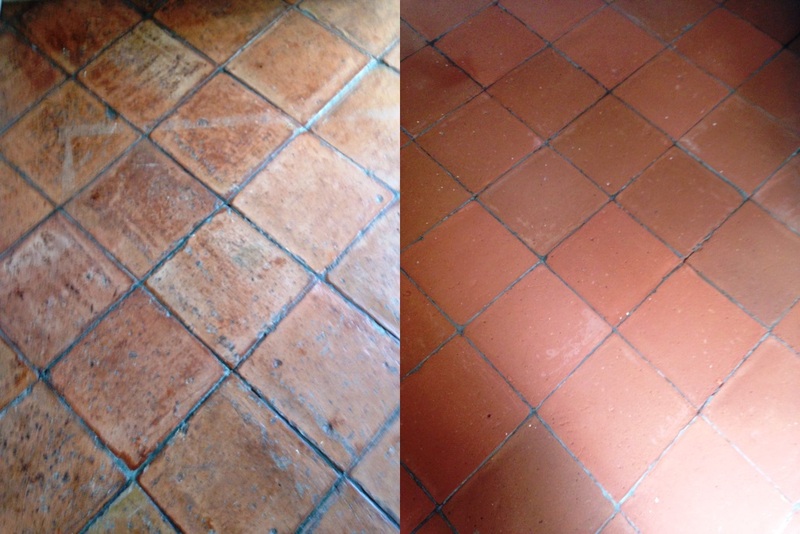 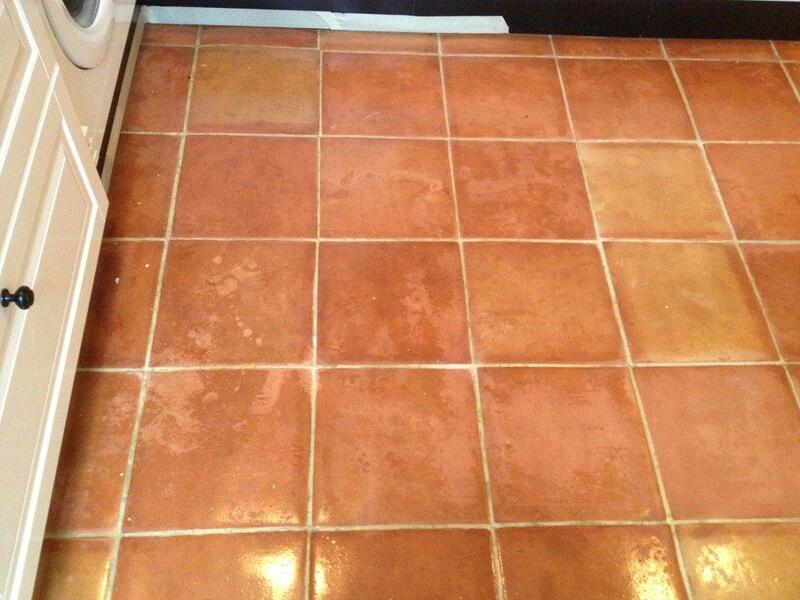 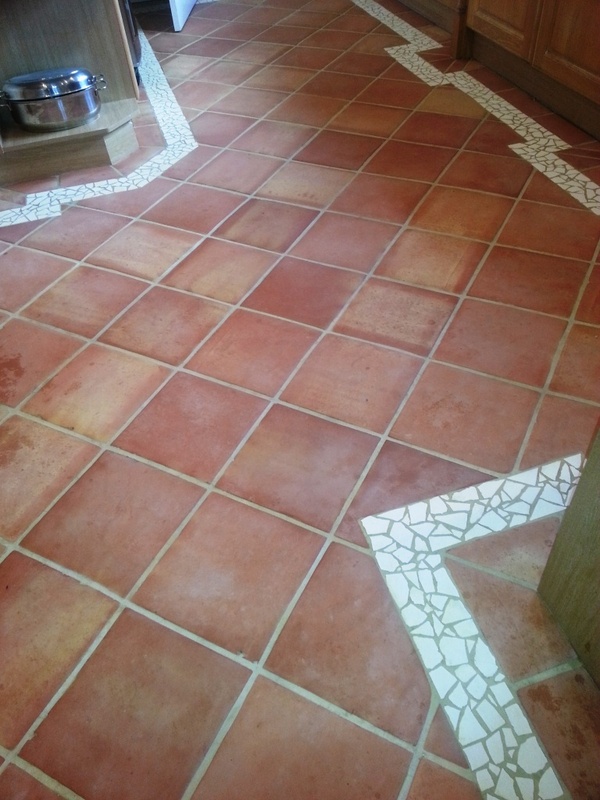 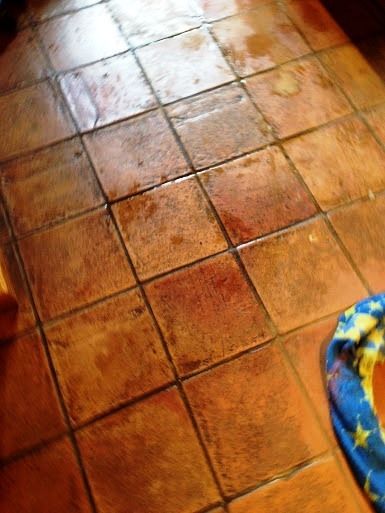 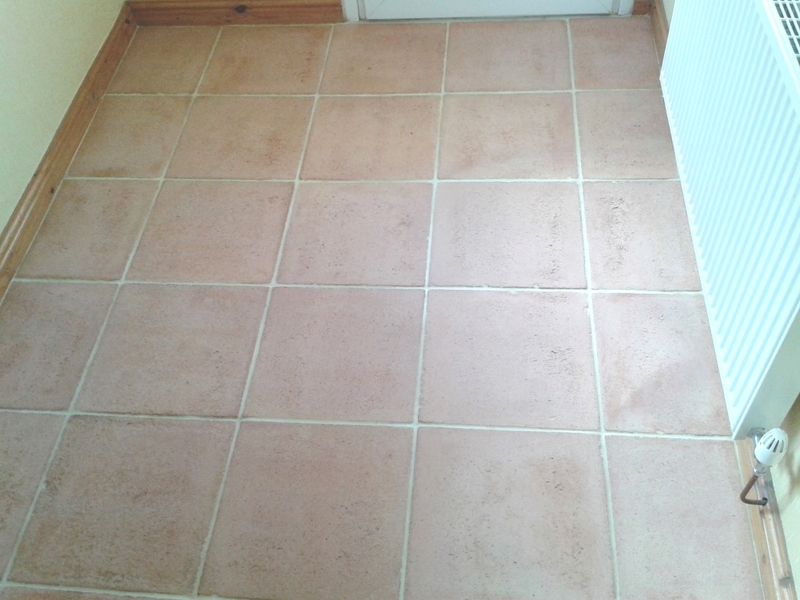 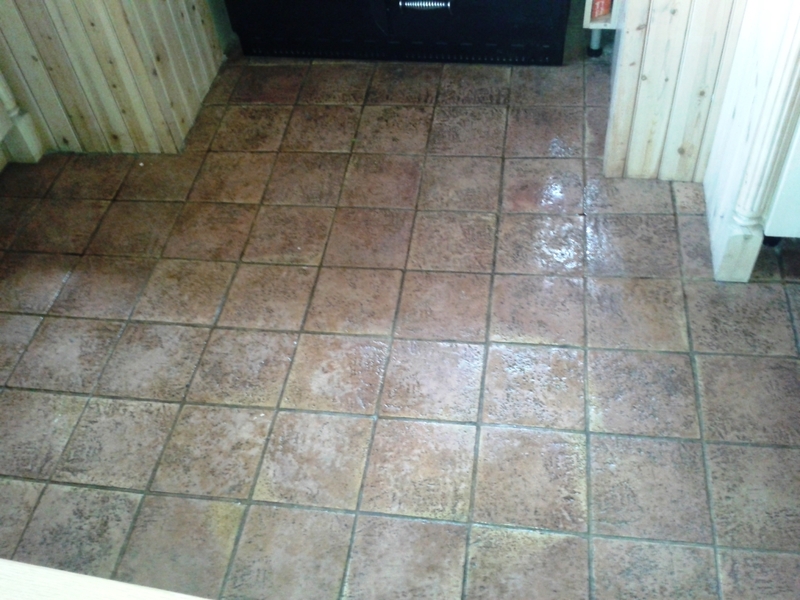 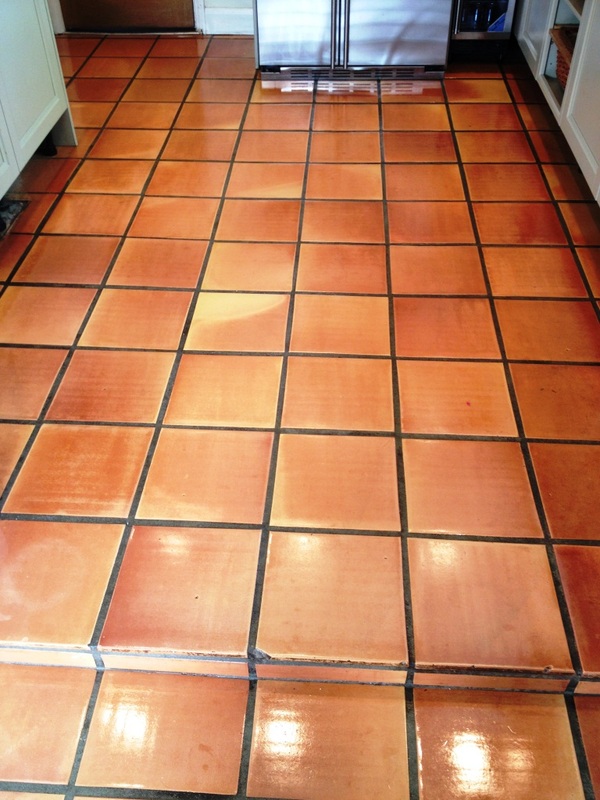 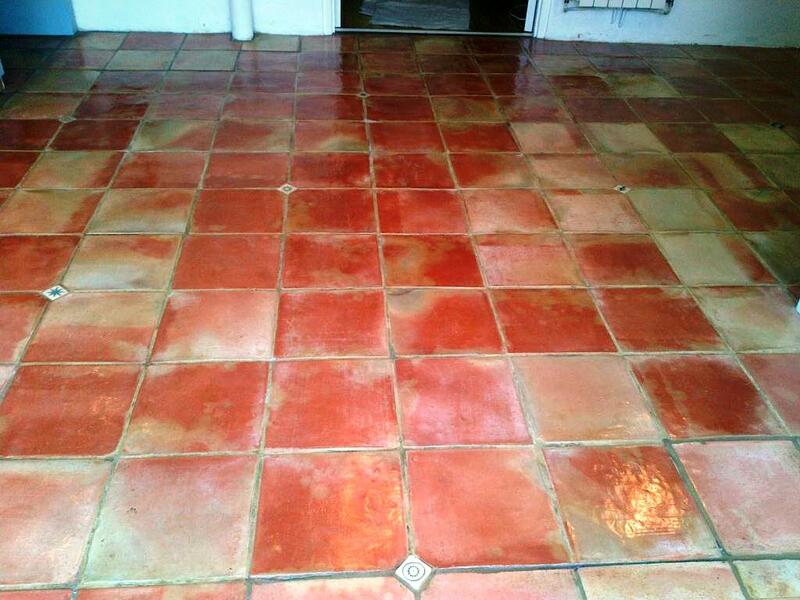 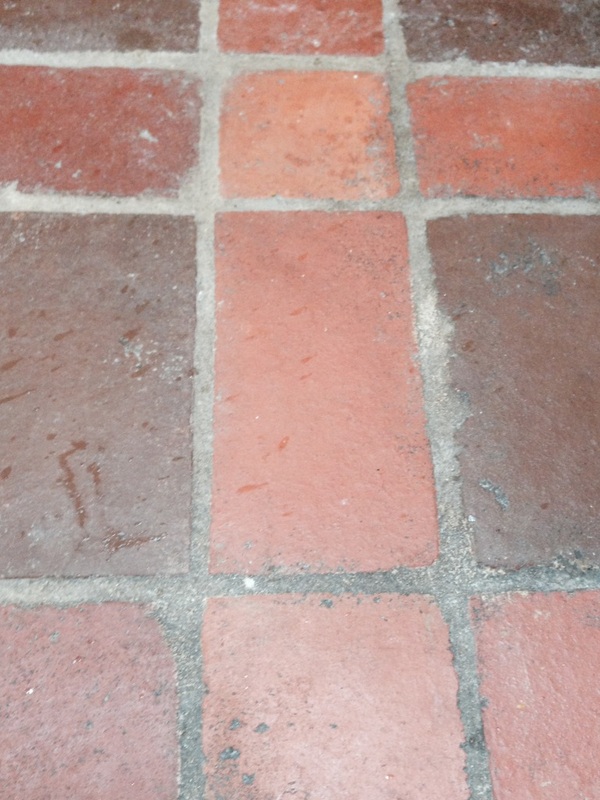 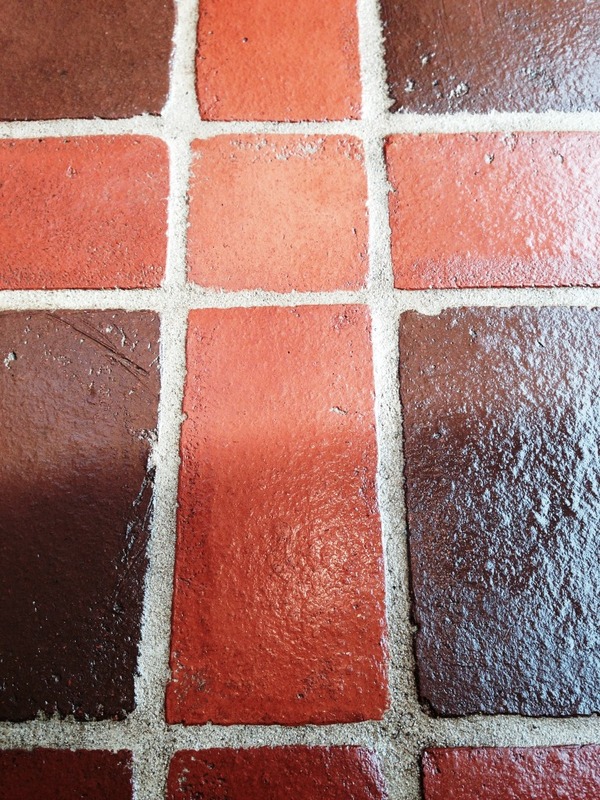 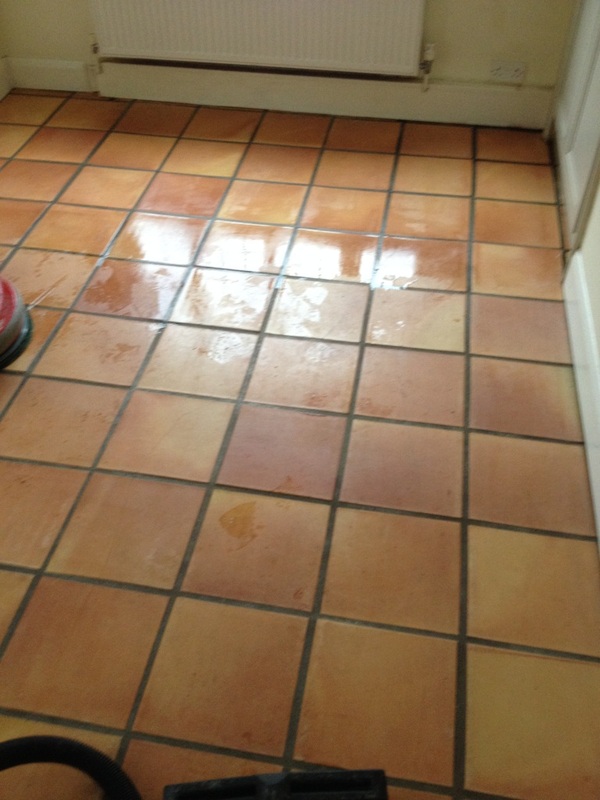 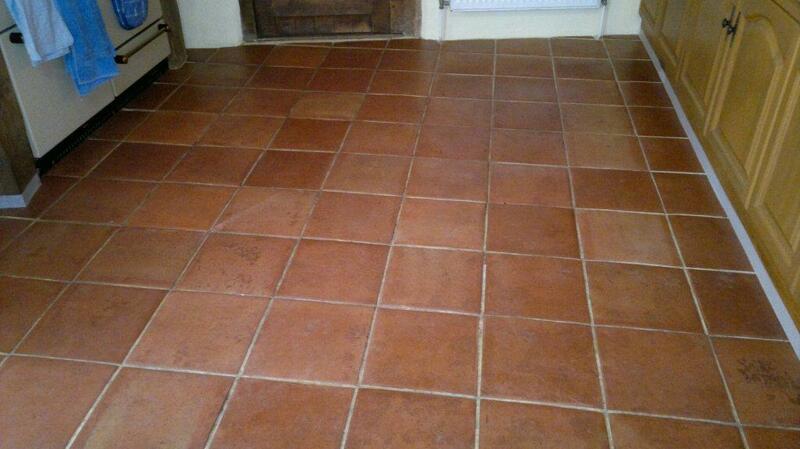 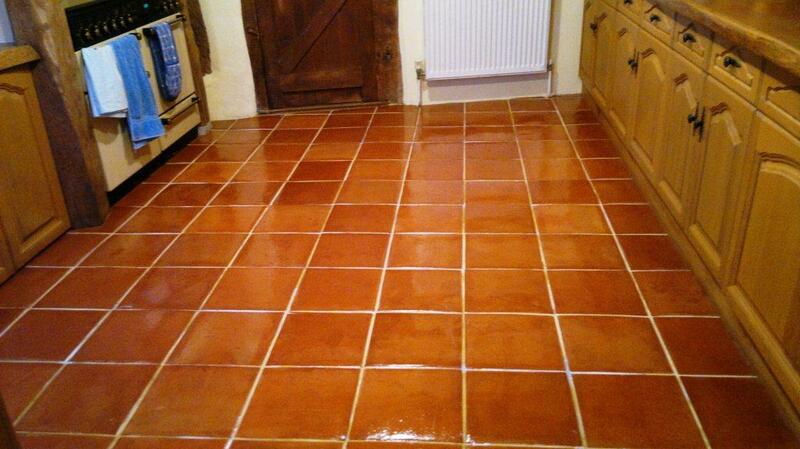 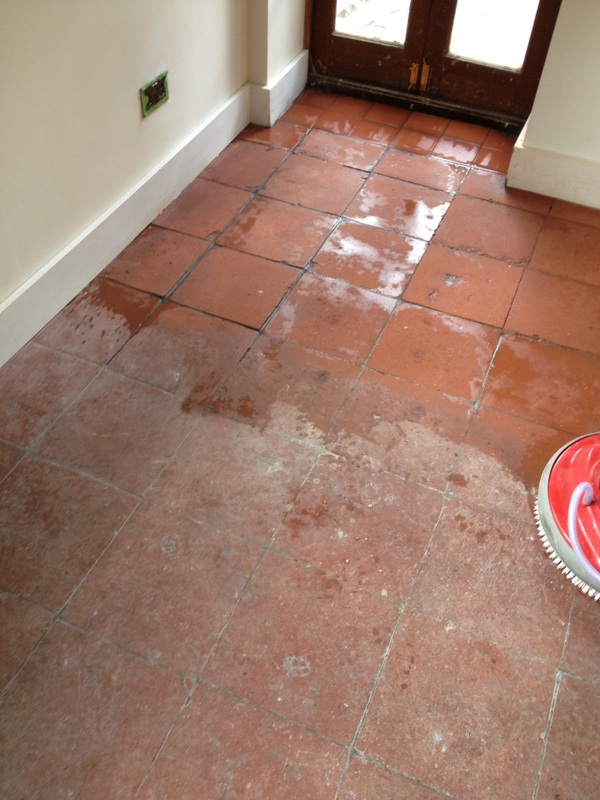 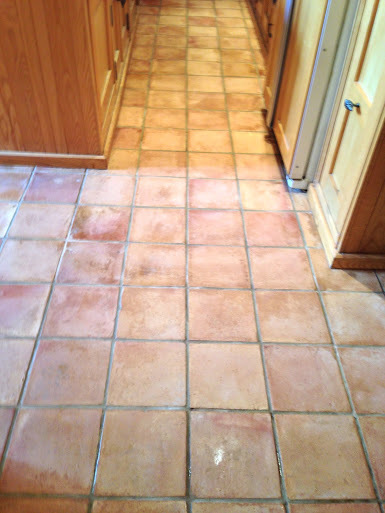 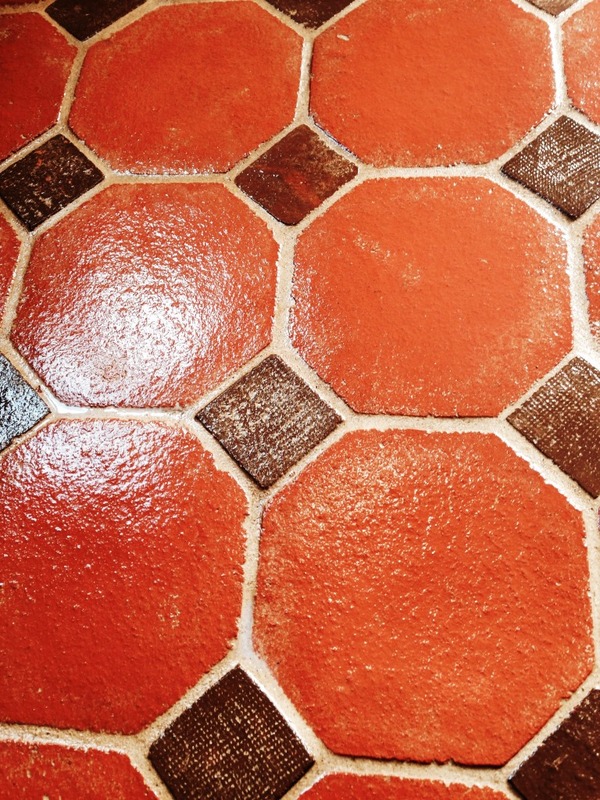 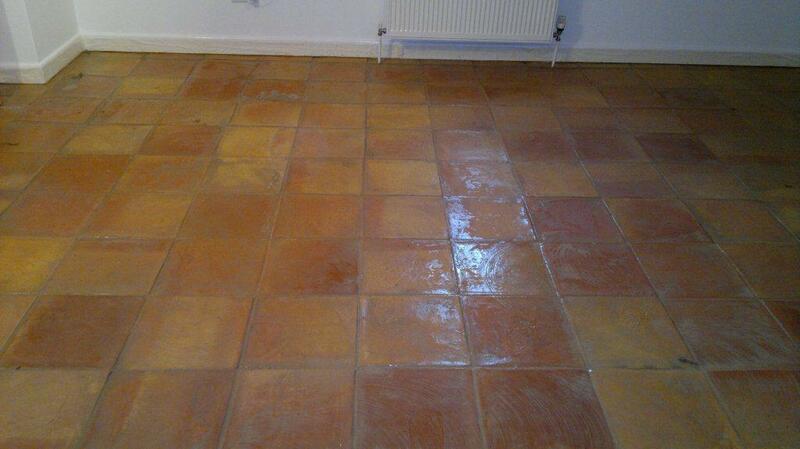 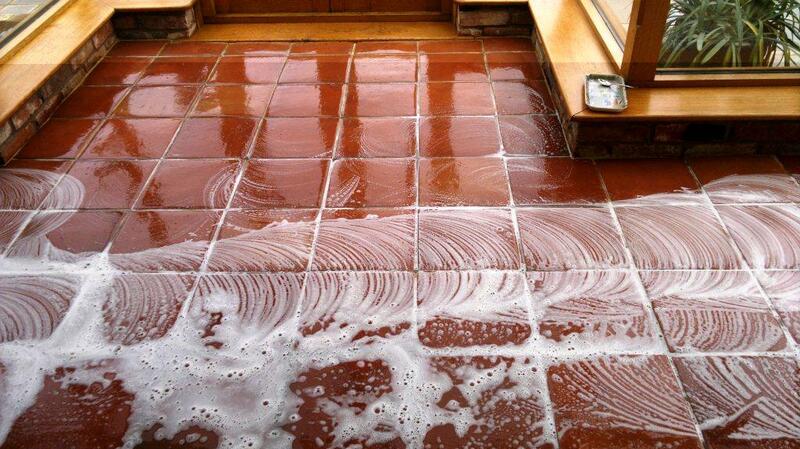 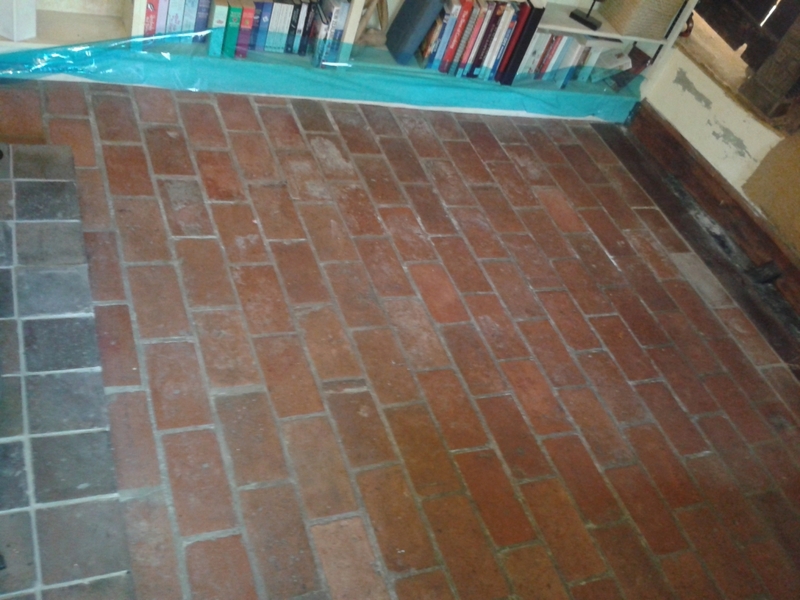 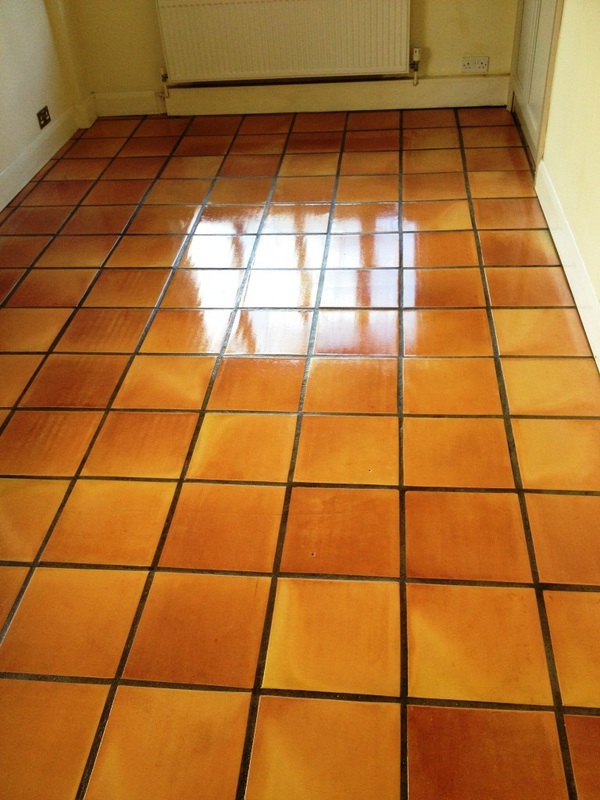 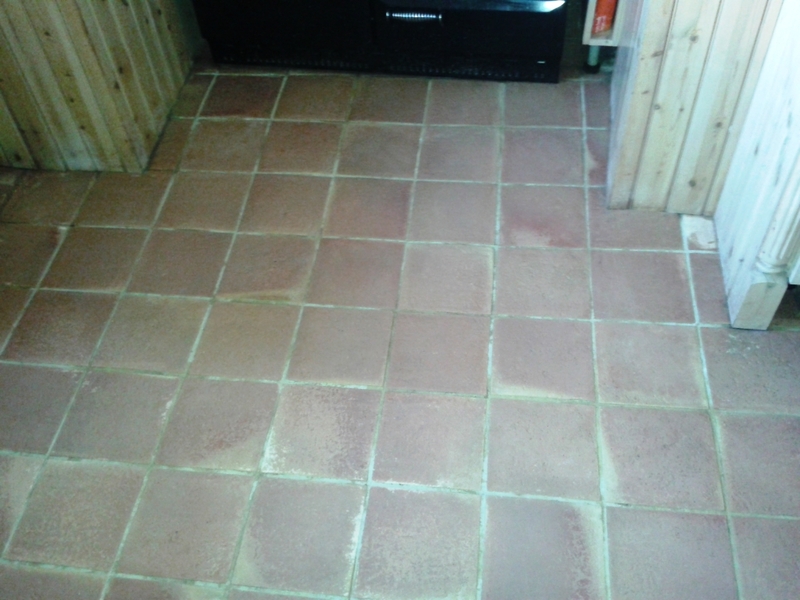 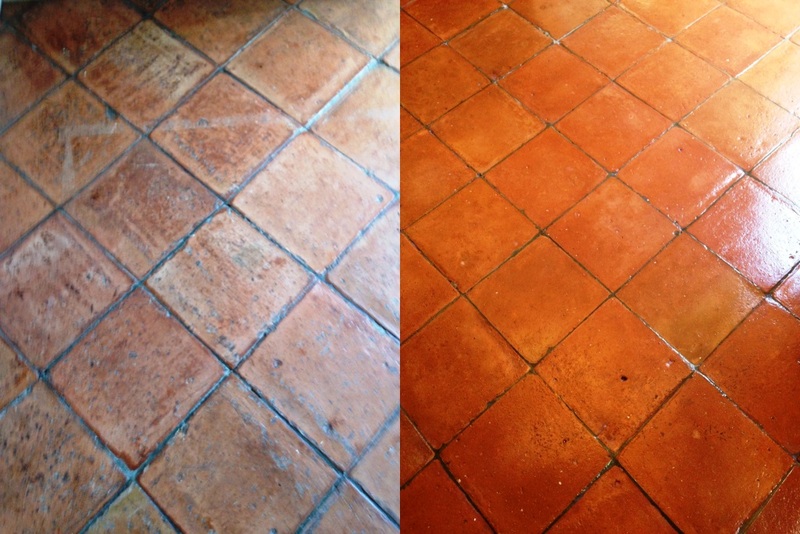 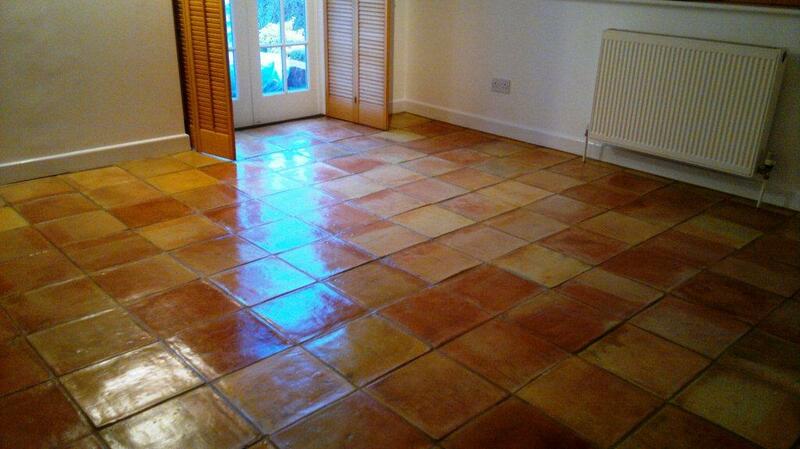 The grout cleaned well and that combined with the new natural look to the Terracotta the floor looks new again.